This new preprint at bioRxiv is quite the Christmas present for those of us with a passion for European genetics and prehistory. It's the first paper to report on full genomes from Mesolithic and Neolithic Europe. All of the successfully tested Mesolithic Y-chromosomes, one from Luxembourg and four from Motala, Sweden, belonged to haplogroup I. This probably won't come as a surprise to many people, as this marker was always the main candidate for Europe's indigenous Y-haplogroup. However, three of the results fell into haplogroup I2a1b, and none into I1, which is today the most common Y-haplogroup in most of Scandinavia. What this suggests is that I1 expanded after the Mesolithic and replaced most of the I2a1b across Northwestern Europe. I'd say these were mostly expansions from North-Central Europe, although recent chatter on the web suggests that two distinct I1 lineages might have arrived in North-Central Europe from Eastern Europe at different times. All of the Mesolithic mtDNA sequences belonged to haplgroups U2 and U5, which is line with past results. The single Neolithic sample, from a 7500 year-old Linearbandkeramik (LBK) site in Stuttgart, Germany, belonged to mtDNA haplogroup T2. Again, not very surprising considering what we've seen to date. West European Hunter-Gatherer (WHG): this ancestral component is based on an 8,000 year-old forager from the Loschbour rock shelter in Luxembourg (one of the individuals mentioned above belonging to I2a1b). The WHG meta-population includes the Loschbour sample and two Mesolithic individuals from the La Brana Cave in Spain. However, today the WHG component peaks among Estonians and Lithuanians, in the East Baltic region, at almost 50%. Early European Farmer (EEF): apparently this is a hybrid component, the result of mixture between "Basal Eurasians" and a WHG-like population possibly from the Balkans. It's based on the aforementioned LBK farmer from Stuttgart, but today peaks at just over 80% among Sardinians. Apart from the Stuttgart sample, the EEF meta-population includes Oetzi the Iceman and a Neolithic Funnelbeaker farmer from Sweden. Ancient North Eurasian (ANE): this is the twist in the tale, a component based on a previously reported genome of a 24,000 year-old Upper Paleolithic forager from South Central Siberia, belonging to Y-hg R*, and known as Mal'ta boy or MA-1 (see here). This component was very likely present in Southern Scandinavia since at least the Mesolithic (see the summary of SHG below), but only seems to have reached Western Europe after the Neolithic. At some point it also spread into the Americas. In Europe today it peaks among Estonians at just over 18%, and, intriguingly, reaches a similar level among Scots. However, numbers weren't given for Finns, Russians and Mordovians, who, according to one of the maps, also carry very high ANE, but their results are confounded by more recent Siberian admixture (see the discussion on the European outliers below). The ANE meta-population includes Mal'ta boy as well as a late Upper Paleolithic sample from Central Siberia, dubbed Afontova Gora-2 (AG2). Scandinavian Hunter-Gatherer (SHG): this is a meta-population made up of Swedish Mesolithic and Neolithic forager samples from Motala and Gotland, respectively. It's a more easterly variant of WHG, with probable ANE admixture. Below are the two most important figures from the paper: a) the three-way mixture model that is a statistical fit to the data, and b) a plot of the proportions of ancestry from each of the three inferred ancestral populations. As per above, East Baltic populations are the most WHG, which is somewhat curious, because they mostly carry Y-DNA R1a and N1c1. So if not for the ANE, we'd simply have a two-way mixture model between indigenous European foragers and migrant Near Eastern farmers, at least for most Europeans anyway. Moreover, the seemingly late and sudden arrival of ANE in much of Europe is important, because it's a smoking gun for a major population upheaval across the continent during the Late Neolithic/Early Bronze Age. Interestingly, archeological data suggest that this was also the period which saw the introduction of new social organization and perhaps Indo-European languages across most of Europe. None of this was lost on the authors of the paper, but it appears they'd rather be cautious pending more ancient genomic data, because they chose not to explicitly mention the Indo-Europeans. This study raises two questions that are important to address in future research. A first is where the EEF picked up their WHG ancestry. Southeastern Europe is a candidate as it lies along the geographic path from Anatolia into central Europe, and hence it should be a priority to study ancient samples from this region. A second question is when and where ANE ancestors admixed with the ancestors of most present-day Europeans. Based on discontinuity in mtDNA haplogroup frequencies in Central Europe, this may have occurred during the Late Neolithic or early Bronze Age ~5,500-4,000 years ago35. A central aim for future work should be to collect transects of ancient Europeans through time and space to illuminate the history of these transformations. The absence of Y-haplogroup R1b in our two sample locations is striking given that it is, at present, the major west European lineage. Importantly, however, it has not yet been found in ancient European contexts prior to a Bell Beaker burial from Germany (2,800-2,000BC)12, while the related R1a lineage has a first known occurrence in a Corded Ware burial also from Germany (2,600BC)13. This casts doubt on early suggestions associating these haplogroups with Paleolithic Europeans14, and is more consistent with their Neolithic entry into Europe at least in the case of R1b15, 16. More research is needed to document the time and place of their earliest occurrence in Europe. Interestingly, the Mal’ta boy belonged to haplogroup R* and we tentatively suggest that some haplogroup R bearers may be responsible for the wider dissemination of Ancient North Eurasian ancestry into Europe, as their haplogroup Q relatives may have plausibly done into the Americas17. No doubt, a lot of people will now be wondering about the main source of the ANE that apparently rushed into Europe at the onset of the metal ages. The Siberian steppe will probably be the favored option for many, since this is where Mal'ta boy and Afontova Gora-2 were dug up. However, I'm pretty sure the source was Eastern Europe. First of all, as already mentioned, it seems that ANE was present in Sweden during the Mesolithic (Figure S12.7 shows around 19% ANE in the Motala12 sample). Secondly, despite the ANE and WHG being classified as separate ancestral and meta-populations, the differences between them appear to be clinal rather than discrete, which I think can be seen in the PCA and ADMIXTURE results from the study (see here and here). Thus, I'd expect a lot more ANE in Eastern Europe during the Mesolithic than in Scandinavia. Thirdly, it's likely that the ancestors of modern Uralic speakers were in Siberia very early, possibly during the Mesolithic, and they were probably East Eurasians aka. Eastern non-Africans (ENA), which ANE is not. Indeed, latest linguistics research suggests that the pre-proto-Uralics migrated at some point from Siberia into the southern Urals, in far eastern Europe. The Uralics proper then expanded from the southern Urals, probably during the Bronze Age, both to the east and west, as far as the Baltic. This Uralic expansion is certainly reflected in the Lazaridis et al. data, and it's not the only relatively late migration into Europe that shows up in their stats. While our three-way mixture model fits the data for most European populations, two sets of populations are poor fits. First, Sicilians, Maltese, and Ashkenazi Jews have EEF estimates beyond the 0-100% interval (SI13) and they cannot be jointly fit with other Europeans (SI12). These populations may have more Near Eastern ancestry than can be explained via EEF admixture (SI13), an inference that is also suggested by the fact that they fall in the gap between European and Near Eastern populations in the PCA of Fig. 1B. Second, we observe that Finns, Mordovians, Russians, Chuvash, and Saami from northeastern Europe do not fit our model (SI12; Extended Data Table 3). To better understand this, for each West Eurasian population in turn we plotted f4(X, Bedouin2; Han, Mbuti) against f4(X, Bedouin2; MA1, Mbuti), using statistics that measure the degree of a European population’s allele sharing with Han Chinese or MA1 (Extended Data Fig. 7). Europeans fall along a line of slope >1 in the plot of these two statistics. However, northeastern Europeans fall away from this line in the direction of Han. This is consistent with Siberian gene flow into some northeastern Europeans after the initial ANE admixture, and may be related to the fact that Y-chromosome haplogroup N 30, 31 is shared between Siberian and northeastern Europeans32, 33 but not with western Europeans. There may in fact be multiple layers of Siberian gene flow into northeastern Europe after the initial ANE gene flow, as our analyses reported in SI 12 show that some Mordovians, Russians and Chuvash have Siberian-related admixture that is significantly more recent than that in Finns (SI12). The authors are actually referring to the Kargopol Russians from the HGDP in that quote. But from my own analyses with a wide variety of samples from Russia, I know that other Russians show similar levels of Siberian admixture to Belorussians, Ukrainians and Estonians. In any case, this of course means that there are more than three ancestral populations for present-day Europeans, albeit not all of them influenced all Europeans. Also, it's very clear that to learn all the details about the peopling of Europe, these sorts of studies really need to start focusing on the large swath of land that stretches from present-day Poland to the Urals. In other words, Eastern Europe. I was also going to discuss the genetically inferred pigmentation of the ancient individuals, but, because of the small sample size, there's not much to discuss at this stage. The Loschbour forager possibly had blue eyes (50% chance), but dark hair and skin. On the other hand, the Stuttgart farmer definitely had dark eyes and hair, but relatively light skin. I wonder if this swarthy hunter-gatherer skin complexion has anything to do with the fact that today lots of people from around the Baltic tan really well? FR7 you reading this? Can you make spatial maps of the ancient components from this study? "Based on the ratio of sequences aligning to chromosomes X and Y, we infer that Stuttgart was female while Loschbour and five Motala individuals were male11 (SI5). Loschbour and four Motala males belonged to Y-chromosome haplogroup I, showing that this was a predominant haplogroup in pre-agricultural northern Europeans12, 13"
Very interesting results. Y-DNA seems to be present in Western HG's after all. "Stuttgart belonged to mtDNA haplogroup T2, typical of Neolithic Europeans10, while Loschbour and all Motala individuals belonged to haplogroups U5 and U2, typical of pre-agricultural Europeans1,"
"By analyzing sites known to affect phenotype, we inferred that neither Stuttgart nor Loschbour could digest milk into adulthood, that both had a >99% probability of dark hair, that Loschbour probably had darker skin than Stuttgart, and that Loschbour had a >50% probability of blue eyes while Stuttgart had a >99% probability of brown eyes (SI7)." The Loschbour hunter gatherer had blue eyes, but darker skin than the brown-eyed, Stuttgart, LBK farmer? Wait a minute...it's him ! This study suggests that he was closely related to groups like Corded Ware and Unetice that invaded Europe from somewhere in the east, probably Eastern Europe, during the Late Neolithic/Early Bronze Age. So it looks like Mal'ta boy was related to the Proto-Indo-Europeans. This makes a lot of sense, because he belonged to Y-DNA R, and the Corded Ware remains to R1a. This is a breakdown of how modern European samples come out as admixtures between the ancient samples. Davidski, The beige component that appears in the K=14 run is not present Mesolithic Euros and is absent in the Basque and Sardinians. It does appear in the Mal'ta boy way out in Siberia, though. It seems IE-related expect for its high frequency in the Levant and Egypt. What's your take on this component? Ah, wow. So hg I was mesolithic European. Especially interesting since I is related to IJ and therefore a cousin of "typically Middle Eastern" hg J. Food for thought. R looks more paleo-Eurasian and less exclusive to Europe. No comment on pigmentation, but I hope you are paying attention barakobama. Most interesting was WHG from Luxembourg. Is this what showed up later with Bell Beakers? "Is this what showed up later with Bell Beakers?" I doubt it, since it peaks in Lithuania. Although the Bell Beakers probably did carry a lot of it. Interesting that the West European Hunter Gatherer is showing strongest in Balts, Scandinavians, Belorussians, and Scotts --- the wild fringe of Neolithic Europe. At first I guessed that WHG (since found in the Luxembourg individual) was a Western- Atlantic-type component, but now I see it's more of a Pan-European culture. Perhaps they should have called it West EURASIAN Hunter Gather. Still, very cool stuff. I don't think it's exclusively IE. I suspect that it was pushed south from the Mammoth Steppe during the Ice Age, and moved into Eastern Europe, the Caucasus, other parts of West Asia, and South Central Asia. Then it expanded again with the Proto-Indo-Europeans from Eastern Europe, along with R1a. It is somewhat puzzling that it didn't manage to move into the Western Mediterranean to any great extent, considering its heavy presence in the East Mediterranean, but I guess there were some good reasons for that, like geography as well as culture. I think K=8 is the most interesting one. Clearly Hg R is corellated with the south-central asian component. It looks like Hg R entered Europe from Central Asia. One can find P,Q,R1a, R1b and R2 in central Asia, but only R1a and R1b in Europe. Well, there's definitely Q and R2 in Europe as well. Actually, one of these ancient samples from Sweden might have been Q, but they couldn't confirm it. More importantly though, for the Indo-European story, Europe has R1a-CTS4385 and R1a-Z645, while Central Asia just has a subset of R1a-Z645, which as you know is R1a-Z93. Yes you are right, but we can never know how Central Asia looked before they were over run by the Mongol and Turkic onslaught. My guess is that they looked a lot like Tajiks everywhere. i meant to say that they did not all look like Tajiks everwhere across central asia...well my guess that is. The only wasy I see the tocharian Centum being explained is that Centum first spread from Central Asia in all directions, while Satem was a later evolution, which only spread with the Proto Indo-Iranians and Balto-Slavs with minimal expansion west and south. We will have to wait for more aDNA obviosuly to know more. "Loschbour and Stuttgart had little or no ANE ancestry, indicating that it was not as pervasive in central Europe around the time of the agricultural transition as it is today. (By implication ANE ancestry was also not present in the ancient Near East; since Stuttgart which has substantial Near Eastern ancestry lacks it.) However, ANE ancestry was already present in at least some Europeans (Scandinavian hunter-gatherers) by ~8,000 years ago, since MA1 shares more alleles with Motala12 than Loschbour:." Given the absence of the component in Neolithic European farmers with roots in the Near East, and at least some presence of the component in Mesolithic remains from Northeastern Europe (Molata12), perhaps the component has been present from Northeastern Europe to at least the Northern side of the Caucasus since Mesolthic times, and it was spread from there to at least the Near East and farther West into Europe. Who knows how long it has been present in South Asia? Yes, I agree, that component has been in Europe for a long time, it's just that it moved into Western and Central Europe after the Neolithic, probably with the early Indo-Europeans. Its presence in the Near East is also likely to be related in part to the Indo-European expansions. Fascinating. Also, I noticed that Table 1 shows Bedouins, Jordanians, Lebanese, Palestinians, and Syrians get a solid (i.e., negative) f3 statistic for Stuttgart + African. So LBK + African = Arabs. Ditto for Stuttgart + South Asians = Armenians, Georgians, etc. This means the EEF got around and were not restricted just to Europe. How can that be? If you look at the PC graph, the closest thing to any WEHG (and particularly to La Braña 2) are Basques and Southern French. This result can only be product of pooling Scandinavian and West European HGs. Lithuanians and Icelanders are closest to Scandinavian HGs but not to West European HGs. The distinction between Scandinavian and Western European HGs and the conclusion that in the end La Braña samples are not really closer to Northern Europeans than to Basques and Southern French (or even to Spaniards) is the first thing I noticed in this study. 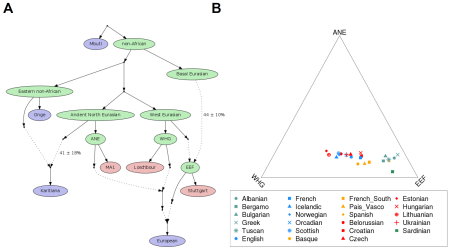 If we use the PC graph to draw conclusions from the four "ancestral populations" (not three), we see that what you call WHG is actually two different things and one (Western European HGs) manifests most strongly in SW Europe (Basques and Southern French) and the other (Scandinavian HGs, Hamburgian instead of Magdalenian) manifests most strongly in the Balto-Scandinavian zone, albeit with strong Northern Eurasian (IE/Uralic) influence. 1. ANE dominated: most Eastern Europeans (Mordvins, Russian, Finnish, Ukrainians, Belorussians) and some other Europeans (Hungarians, Czechs, Bulgarians even some Albanians). 2. Scandinavian HG dominated: Middle-Western Europeans, Scandinavians and Baltics. 3. Western European HG dominated: Basques and some French (notably all Southern French). 4. Neolithic dominated: Sardinians, Canarians, Spaniards, Italians, Maltese, Greek. So I believe that, judging on the PC graph, pooling WEHG and SHG in a single pooled sample seems dramatically distorting of reality. Isn't the text of this paper all about differentiating Magdalenian WEHG like Loschbour and Hamburgian SHG like Motala? Then why this last minute artificial blurring? You can't just focus on the PCA and ignore everything else. Post-Mesolithic North Eurasian gene flow across the north skews the PCA results in this case, and makes it look like WHG aren't all that closely related to Northeast Europeans. But they are, it's just that Northeast Europeans have a lot of ANE and Uralic admixture. I had not found the supplemental material yet, sorry. I still find both contradictory in appearance and possibly in substance. "Post-Mesolithic North Eurasian gene flow across the north skews the PCA results in this case, and makes it look like WHG aren't all that closely related to Northeast Europeans". They are different components in all the study. Whether the genetic influence is post- or pre-Epipaleolithic (there was no "Mesolithic" in Europe) is irrelevant to the results. What are you talking about? In case (a), EEFs are closer to West Asians while in case (b) they are not, rather to Braña 2 instead. Similarly, if (c) you trace a median line between Braña 2 and the EEFs, Basques are closer to Braña 2, but, if (d) you trace a median line between Lochsbour and the EEFs, Basques are closer to these. However I do not understand why Eastern and Central Europeans do not score much much higher in the ANE column, because judging from the PCA they should be like 60-80% ANE, even if you use Lochsbour and MA1 as references, instead of the more central HG samples. Whether the genetic influx happened at one point or another, it should not matter, after all they are comparing ancient individuals with moderns without previous modeling. I wonder if it is the presence of non-WEA populations what is causing this distortion. In any case, after seeing that PCA, I'd have produced a second one, with only Europeans and at most a few control West Asians. It could be clarifying. Too many outliers usually blurry things rather than clarify and, after all, all ancient samples are closer to Europeans than to anybody else, even MA1. "... it's just that Northeast Europeans have a lot of ANE and Uralic admixture." According to the data of the supplementary material, they do not: the largest figure is 18.7% in Estonians, compare with the record low 4.1% in Sardinians. That's not "a lot", certainly not in the way that it appears in the PCA. I'm not sure but I suspect that the distortion is caused in the PCA because the ANE samples there are defined essentially in the vector of East Asian and Oceanian polarity, which is in real terms much larger than it appears (surely because they are "projected", whatever that means) so the realistic distance appears somehow extremely "compressed". My best guess in any case. I just hope that they can fathom a second PCA without so many outliers for the formal publication, maybe even a third and fourth (chewing on some possible wise sampling strategies, including a PCA with just aDNA individuals and then forcing moderns in it relative to them - supervised mode or whatever that is). It seems the genetic origin of Europeans will come close to being figured very soon. This looks like a very serious study. When you add this to new info that will be released about La Brana-1, Rise Project, the Genomic History of Denmark, DNA from ancient Pontiac steppe people, Mal'ta, a thousands and thousands of ancient Eurasian Y DNA and mtDNA samples, other stuff I don't know about, And everything we can ever want from modern populations. It is amazing how much has been discovered already. I wont be surprised that in 50 years from now people will have a basic understanding of the genetic history of all humans.
" The first are Ancient North Eurasians (ANE), who are more closely related to Upper Paleolithic Siberians than to any present-day population. The second are West European Hunter-Gatherers (WHG), related to the Loschbour individual, who contributed to all Europeans but not to Near Easterners. The third are Early European Farmers (EEF), related to the Stuttgart individual, who were mainly of Near Eastern origin but also harbored WHG-related ancestry. " I think most people who are interested in this stuff already basically knew that. Modern Europeans are a mix between pre Neolithic hunter gatherers, near eastern farmers, and Mal'ta like people. It seems WHG represents what has been called north European like ancestry, which has been hypothesized based on autosomal DNA from Mesolithic Europeans to be descended from them. Why did they call it west European hunter gatherers? Was it isolated to western Europe and later spread to eastern Europe were it is most popular today. mtDNA from east European and Scandinavian hunter gatherers show they dominated by mtDNA U5 and U4 like the western ones. It would make sense they had very similar ancestry. There are also traces of "north European like ancestry" in near easterns, north Africans, central Asians, and Siberians. So to say they didn't affect near easterns only Europeans doesn't make sense to me. We know Indo Iranian languages were brought to the near east by Europeans. There is always random mixing too. I think the LBK guy probably is similar to Otzi and Gok4. Probably had majority Meditreaen in globe13 with also a good amount of southwest Asian, west Asian, and north European. When they say mainly of near eastern origin, I don't think they mean they were extremely similar to modern near easterns. It is not a surprise they also have some WHG like ancestry since ancient mtDNA shows they mixed, not much though. I doubt the ANE's made a big contribution. I wonder though if related people to Mal'ta took up a lot of Europe for a long time. They didn't say the 8,000 year old Swedish hunter gatherer was similar to the other hunter gatherer, maybe he was like Malta. I doubt it because mtDNA from Mesolithic Sweden(Pitted ware, and St. Forvar) show they were no different from other hunter gatherers of Europe dominated by mtDNA U5 and U4. The St. Forvar 8,600 year old hunter gatherer from Sweden was very similar to the Pitted ware hunter gatherers, La Brana's, and I would assume the 8,000 year old hunter gatherer from Luxemburg. "We model the deep relationships of these populations and show that about ~44% of the ancestry of EEF derived from a basal Eurasian lineage that split prior to the separation of other non-Africans." WOW!!!!! That is surprising, based on their mtDNA and autosomal DNA from other farmers, I would assume they were nearly 100% west Eurasian. I have heard Davidski say their main component is usually called Meditreaen(peaks in Sardinia) in autosomal DNA tests and is very related to what is usually called southwest Asian(Davidski says peaks in Bedouins) are closely related. Take out the north European admixture in Meditreaen and the east African admixture in southwest Asian and there basically the same. It seems that is what Davidski has said(correct me if I'm wrong). Looks like I2a1b was widespread in Mesolthic Europeans"
This is even better than learning more about La Brana-1. It finally proves Y DNA I descends from pre Neolithic Europe. I don't want to rub it in the faces of Neolithic Y DNA I theorist, though. I don't claim to be some expert I just mainly listened to what others said. So, Maju I think this is evidence that I2a1 in trellis was probably descended from hunter gatherers not Greek Neolithic, maybe related Greek hunter gatherers. I would have expected I1 for the Swedish ones, but whatever. There is a north-west European I2a1b subclade,, I2a1b1 L161.1 I wont be surprised if it descends from the hunter gatherers of north-west Europe. Since the Luxemburg guy had it and one Swedish one. That probably also means I2a1b has been present in eastern Europe for just as long. Same for I2a1a1 M26 in western Europe, same with I2a2 in central Europe, all other I2 in Europe, I1?. Possibly I2a2, I2a1a1, and I1 spread in the Neolithic and metal ages and replaced a lot of I2a1b. There are a lot of ideas running in my head. Eupedia has a pretty good page for Y DNA I2 rightfully calling it "Continental Europe's Mesolithic paternal lineage". Maciamo says there have been rare I2a1a P237.5 subclades found in north-western Europe and are probably descended from north-west European hunter gatherers. No surprised, still don't understand why such a large amount of hunter gatherer ancestry survived but not maternal lineages? Well, Y DNA I shows a lot of their paternal lineages did. Okay, so far we know 24,000 year old Upper Palaeolithic Siberian Mal'ta had "dark skin, dark brown hair, and brown eyes", 7,000ybp late Mesolithic hunter gatherer from northern Spain La Brana-1 had blue eyes, ~5,300ybp early copper age farmer from the Alps Otzi, had "brown hair, brown eyes, and fair skin", Copper age people of Pontiac steppe from 3,000 and 2,000BC had pale skin and darker eyes than average modern Europeans, we know bronze and iron age kurgen probably Indo Iranian people of Siberia(probably most of Asia) had pale skin, majority light hair and eyes. If that info is legit, we also know that 8,000 year old late Mesolithic hunter gatherer from Luxemburg had 50%< chance of blue eyes and 99%< chance of dark hair, 7,500 year old early Neolithic farmer from central Germany had 99%< for dark hair, 99%< for brown eyes, and had paler skin than the 8,000 year old late Mesolithic hunter gatherer from Luxemburg. What has been found by so many people in autosomal DNA. Is that there is very exclusive ancestry in Europeans that is higher in Mesolithic hunter gatherer samples so far, and from what I have seen is it correlates with light hair and eyes. Not perfectly though Sami are about as dark haired and eyes as southern Europeans. So the dark hair and also likely blue eyes in the Mesolithic man from Luxemburg is not a surprise. What is surprising is that he probably had darker skin than the 7,500ybp LBK farmer. Because I excepted the farmers to be overall darker pigmented. The Meditreaen in globe13 and in many other tests is extremely high in farmer samples so far. Meditreaen, southwest Asian, and west Asian in globe13 are highest in darker haired and eyed, and tanner skinned Europeans. These ancient samples could mean it is a lot more complicated. It is possible the hunter gatherers were not as pale as I first thought and the farmers are not as dark as I first thought. Predictions for how long pale features in Europeans have existed are usually pretty recent starting in the Mesolithic. So it is definitely possibly many Mesolithic and definitely Palaeolithic Europeans were white-olive skinned and very dark haired and eyed. Maybe most modern Europeans Mesolithic ancestry is from the paler ones. "By analyzing sites known to affect phenotype, we inferred that neither Stuttgart nor Loschbour could digest milk into adulthood"
I know very little about this, but I do know lactose persistence is highest in Europeans, so no surprise. There's really no need to focus on the PCA all that much, because the paper by and large isn't based on it. The meat and potatoes of the study are the formal mixture tests. H/G = Y-DNA I, mtDNA: U5, blue eyes, possibly somewhat "tanned" skin. physically phenotypes: Robust, wide faced, round skulled. As modern anchestor phenotypes are usualy named: Brunn on the British Isles, Borreby in Scandinavia and northern Germany and Baltid south and east of the Baltic sea. EEF: Y-DNA G+E, mtDNA H, K... lots others. Brown eyed but white skin. Physical phenotypes: filigrane, light boned, slim faced and with longish skulls. Generally refered to as "Mediteranide" type. Did they say something about ANE Y-DNA? Is it true that that 20K year old R guy from Sibiria has ANE like autosomal DNA? Did they explain why ANE populations seem to be responsable for 40-80% of West Europeas paternal lineages (40-60% in NE Europe) but contribute only 12-18% autosomal DNA? Genetical drift? Founder Effects? Wow, you know a lot about their skeletal features. It is not just mtDNA U5, but also U4, U2(specifically U2e but also possibly other lineages), "north European" like ancestry probably what WGH stands for, Y DNA I, blue eyes(also 50%< chance for brown eyes, right?) probably all light eyes, tannish but probably still pale, dark hair, has now been identified in Mesolithic west European hunter gatherers. There are also debatable mtDNA H(including H1b and H7) samples from Mesolithic Portugal, for sure H from Mesolithic Karelia, debated H(including H6) from Magdalenian Palaeolithic northern Spain, possibly H's from multiple samples from Palaeolithic Europe and also possibly RO's and HV's. There are also U*'s with no modern lineages found in Palaeolithic Europe. So the mtDNA from pre Neolithic Europe is not so pure and the same. Y DNA J and T also probably existed in Neolithic Europeans, probably almost all west Eurasian mtDNA that is non U5, U2e, U4, and U* in Europe is descended from Neolithic farmers. Brown eyes, dark hair, and pale skin(still not for sure for the LBK guy) is probably a good description of the pigmentation of Neolithic European farmers. They probably looked most similar to modern southern Europeans. Fanty, you've never heard of Mal'ta boy? Look through Eurogenes old threads from October or November you will find it, also look at threads about him on Dienekes and for what they were.... we are. He had Y DNA R* it was apart of a separate lineage from R1 and R2, so it can be ancestral to modern European R1. I heard that some experts from FTDNA say it is likely that another upper Palaeolithic Siberian from the same area but from around 11,000-17,000ybp(not 100% sure), most likely had Y DNA R1a1a1 M417*, he also was most related to west Eurasians. So who knows Y DNA R in Eurasia today might originally have a origin in Siberia or with people connected to the Mal'ta people. Over 1,00's and 1,000's of years of mixing the original Y DNA R people's blood gets smaller and smaller and smaller. Y DNA R1 spread very recently in Europe mainly with Indo Europeans and I haven't heard of any pre Neolithic R lineages in Europe except R1a is a likely possibility. Pre Neolithic European hunter gatherer ancestry is what makes modern Europeans distinct. So I doubt Mal'ta's people are the main or a very big part of European ancestry. Following their figure 2A model whereby EEF is 44% (ish) "basal Eurasian", one of the interesting things we can do with these proportions Davidski posted up is transform these percentages into percentages of West Eurasian, "basal Eurasian" and ANE ancestry (e.g. West Eurasian is all the WHG ancestry + 56% of EEF, while BE is 44% of EEF). From Extended Data Figure 6: Another thing I notice here is that Europeans apparently have only EEF (Stuttgart) and ANE (Malta) in common with Middle Eastern and (I would guess) South Asians. WHG is exclusive to Europe. Too bad they didn't include South Asians or Central Asians in this. Aside from that, the Basal Eurasian really stands out as a novel key finding. Looking at the k-means output, a little bit of the Stuttgart/Sardinian (magenta) in k=20 shows up in Afar and Ethiopian Jews (just a tad bit also in Oromos and Somalis). At k=20, the magenta Stuttgart/Sardinian also shows up in Nogay, Turkmen, Uzbeks, and Kuchin Jews, also a little bit in Hazara, Uyghur, and Kusunda. Also notice this study includes Ami and Atayal, which form their own component at k=19 and k=20. Shows up in Chinese, Japanese, Cambodians, etc. "There's really no need to focus on the PCA all that much, because the paper by and large isn't based on it. The meat and potatoes of the study are the formal mixture tests". I understand that the authors chose to do that. However the PCA seems to evidence some shortcomings, not so much of the methodology, I guess but of the samples choice for the "formal mixture tests". As I said before, it seems obvious that if these tests would have been performed with Braña 2 instead of Lochsbour, the results would be radically different, because in the PCA Braña 2 is as distant from Lochsbour as this one is from the most distant EEF sample or to Russians. I see therefore important methodological contradictions which are most apparent when contrasting with the PCA, the only test where all ancient samples are present. It's very possible that Lochsbour is not really representative, much less ancestral, to the Western European Hunter-Gatherer component in modern Europeans (and even in EEFs) but a marginal line. Have you even looked at his skull? He looks "archaic" or otherwise very anomalous with low forehead and very prominent browridge, totally unlike our usual Paleolithic HG, let alone modern Europeans. He's obviously not "archaic" in the genetic aspect but he's quite strange-looking in both the phenotype and the genetic aspect as well. But, as I pointed above there are other less clear issues, notably the extreme difference between ANE (rel. to MA1) in the formal tests and in the PCA, where MA1 relationship seems overwhelmingly dominant for Eastern+ Europeans. @Matt: what would be "Basal Eurasian"? All aDNA samples are West Eurasian or of clear West Eurasian (and even European) affinity. I don't make any sense of your transformations. Maju, i would like to see more evidence of way you think modern Basque and southern French are so close to La Brana-2 and WEH. Honestly Maju i think you are a bit biased because your Basque. Just looking at the globe13, K12b, and K7b results of La Brana(not sure which), Davidski's thread about Mesolithic ancestry in Europe, and that the Spanish scientist said he was most related to modern north Europeans not Spanish, makes me think what you saying is biased and not accurate. I have seen you argue that the same thing in Fennoscandia Biographic project. It seems pretty clear to me many people who create autosomal DNA tests(including from Geno 2.0) have found very distinct ancestry in modern Europeans that is highest in Lithuanians. My ranking based on the tests results I have seen are. It also seems pretty obvious to me that what has been called Meditreaen type ancestry descend from Neolithic farmers like Otzi, Gok4, and probably this LBK girl. I know your a freaking genius and I respect your opinion so I would like to see all your evidence that isn't true. "Yeah I know "R = Indio Eropeans"... but wait, they said THREE populations are resplonsable for modern European genetics: WHG, EEF and ANE, they dont say anything about a 4. like "Indio Europeans", so.... whats R? Seems like the only ANE whos Y-DNA we know has R?" I think it will eventually turn out to be 4 components with the confusion caused by three of them closely related i.e an ancient parental hyperborean HG population split into eastern and western child clusters by the ice followed later by the farmers pushing more into the western child cluster than the eastern child cluster before being over-run by both of them via a HG to herder transition (two imo, first a western and then an eastern). "Did they explain why ANE populations seem to be responsable for 40-80% of West Europeas paternal lineages (40-60% in NE Europe) but contribute only 12-18% autosomal DNA? Genetical drift? Founder Effects?" Herder over-run, smaller population > larger population? Barak, you have obviously a fetish about Finnish-Sami, I saw it already when you tried to connect our yDna's that are common with almost every group from Russia to Scandinavia and Baltic countries, except certain N1c1 that connect Finns and Samis. We have a common FU-language root, our languages diverged earlier than any other languages in the whole Northern Europe, excluding Slavic and Germanic proto languages. We have common admix, like we have with Estonians, Northern Russians and Scandinavians, but our genetic distance is at least ten times what you see between countries in Central Europe. There has been Finnish migrations to the Lapland, like has been also to Sweden and Swedish migrations to Finland, South Saamis have a significant Sacndinavian admix, but being honest you shouldn't connect these events to our ancient roots only because you have a fetish. I am not going to repeat this to you, only now and once. barakobama what does it mean your "Non Slavic Russians"? My PC cant download all the info about these ancient samples. I did though look at the link with K=19 results of these ancient sample, MfA showed. Davidski, all the hunter gatherer's are 100% something, and the farmer was mainly something else but with a little hunter gatherer, and Malta was extremely mixed with some blue, that is what was excepted right? I think these hunter gatherers unlike La Brana's and the Pitted ware guys, had no farmer ancestry, not a surprise farming had not reached their area of Europe. I bet in globe13 and K12b they would come out 100% North European. I bet the LBK person will be very similar to Otzi and Gok4. Mal'ta also has a lot of Native American and some south Asian and a tiny tiny bit of Oceania and I guess also Admananese(Onge). That is similar to the K=9 in you showed. Since Mal'ta people had similar culture to Europeans at that time, Y DNA I is estimated to be about 25,000 years old, two 31,155 year old mtDNA pre U5(2 of 5 defining mutations), was found in the Czech Republic, and that U5 is estimated to be over 30,000 years old. Makes me think that those Mesolithic European hunter gatherers are mainly descended from Upper Palaeolithic European hunter gatherers associated with cultures like Gravettian. U2e has already been found in Germany from 11,000ybp, Karelia from 7,500ybp, and now Sweden from 8,000ybp, we already know U5 and U4 have been found all over Europe from the Mesolithic. I think the relation all those hunter gatherers in Europe had in the Mesolithic went very far back like before the LGM. The U5a(no U5b), U2e, and U4(St.. Forvar) already found in Mesolithic hunter gatherers of Sweden or I guess St, Forvar was from an island by Gotland but whatever. I think that means they were closely related to the hunter gatherers of Karelia and far eastern Europe period. Who had a high amount of U5(all U5a), U4, and U2e. That may mean the Karelia people also had I2a1b, I would think possibly also some other type of I, N1c, an even R1a. The mtDNA's in the RO family found in Mesolithic and Palaeolithic Europe complicates the mtDNA story of pre Neolithic Europe. I just found today I have mtDNA U5, so a direct maternal lineage that goes back over 30,000 years in Europe, my Dad has H64 which has only been found in 4 European samples out of over 10,000. I wonder if it has a Neolithic farmer origin like probably most H in Europe or a strange member of the RO family that has existed in Europe since before the Neolithic. Ethnic groups in Russia like Udmurts, Mordovians, Bashkirs, etc. who are not Slavic Russians, i don't mean ones by the Caucasus mountains or far east. What are talking about? I don't have a fetish towards Finnish-Sami. They are one of many people I have researched on. My rankings were honest and had no favoritism or un favoritism towards any people. You guys have distinct I1a2 L22 subclades that take up about 80% of your I1 and around 20% of your total Y DNA, that has a common ancestor with Swedish-Norwegian I1 from before the bronze age. I know your N1c1 is shared with Baltics and Uralics and other people in Russia. There may be subclades that are unique to certain regions and ethnic groups like with I1. You guys are very related because your languages are most related to each other, they share the same I1a2 l22 subclades and high amount of N1c, both have a high amount of mtDNA U5b1b1 and V, and you guys live right next to each other. I understand you guys aren't identical, but you definitely come from the same or very related root. Will it be possible for you to create an ADMIXTURE analysis now that can give an individual proportions of European Neolithic farmer, European Mesolithic hunter-gatherer and Ancient North Eurasian ancestry? I was going to inquire about creating a calculator as well. However, I was wondering if the authors would release the allele frequencies that were used, so one could compare individual results with those from the paper. These results are certainly surprising, especially since I2-M423 is rather rare in modern Scandinavia. I don't think I would extrapolate these results and state all I is mesolithic, since these samples are all I2-M423. Furthermore are these samples related to each other? Why don't you then, being a serious researcher, update your beliefs to the knowledge level of serious researcher. If you could do it, you could also know that the closest upstream SNP (CTS2208) of the Finnish "Bothnian" I1 (the biggest subclade in Finland) is found from Germany (Saxony) and from Eastern England? You could also know that a lot of Finnish N1c1 clades is shared with Estonians and Swedes, in Sweden seaside areas nearest to the Baltic region. Don't bother people by your generalisations; the Russians could hear you telling that their Rurikid princes were Finns or Samis, Speaking about the languages following time lines like you I could bundle to English an Serbian people and speak about Serbian-English history. Maybe I start it and then wonder why people don't take me seriously. I've updated the post with lots of commentary. @ Maju - the model given in the paper models Europeans as a mixture of European Early Farmers, ANE and West Eurasian Hunter Gatherers. It also models West Eurasian Hunter Gatherers as descended entirely from a West Eurasian population, and European Early Farmers as a mix of this "West Eurasian" population and a "basal Eurasian" population in about a 44:56 ratio. This is given in the abstract and the Figure 2 A model. So we can approximate basal Eurasian, "West Eurasian" and ANE proportions in the populations based on the above. Based on their assumptions. One note about the "West Eurasian" population here is that it, like ANE, it actually shares more drift with East Eurasian hunter gatherers than the "basal Eurasian" does. In other words, their "West Eurasian" is more East Eurasian like than "basal Eurasian" is. Even though this is the element which may contribute most to distinguish the most distant present West Eurasian populations from other world populations, they've labelled it as basal Eurasian because they are operating under a model of serial founder effects / bottlenecks, where this is presumed to split off first. "So what could be the cause of this relatively recent Siberian gene flow into Northeastern Europe? The best bet is the Uralic expansion and, for the Chuvash and Mordovians, perhaps also the Turkic expansion. Based on latest linguistic research, the pre-proto-Uralics appear to have expanded at some point from Siberia into the Volga-Ural region, in far eastern Europe. During the Bronze Age the Uralics proper then expanded from the Volga-Ural both back to the east and also west, as far as the Baltic (see here). I don't know if there's any consensus on when these two expansions took place, but it'd be interesting to find out." This sounds geberally great. However this study saw the Finnish-Siberian admix clearly older than Mordovian-Siberian admix, despite of the linguistic branches. Finns and Mordovians belong to the same branch being parallel. So we need more explanations if we want to use linguistic explanations to resolve genetic problems. I can't claim that I know, but being stupid enough to look only these results we now have I would consider linguistic adaptation in Iron Age Finland and Estonia and Scandinaian admix in Finland with people of mesolithic origin. Looking at your double Uralic migrations the Siberian admix in Finland should be from the first one and Baltic-Finnic people from the second one. What about the Turkic expansions, couldn't they have made the estimated dates of the Siberian-like admixture more recent for the Chuvash, Mordovians and even Kargopol Russians? Also, Baltic Finns are near the Baltic, as you well know. While Kargopol Russians, Mordovians and Chuvash are in Russia, with Tatarstan and Western Siberia not that far away. Thus, very recent contacts between populations within Russia, which obviously didn't affect Finland, might also be the cause for this discrepancy. Yes, it could have been the Turkic expansion or other Eastern expansions. We know the history in Russia under the Turkic reference during the first millennium. This study gives for the age of Mordovian-Siberian admix 69.8 generations, around 1750 years. What a chance to make a conclusion about where they got the newer Siberian-like admix. It doesn't give the admix age for the Finnish Siberian, but it should be about 4000 years old, plus-minus something depending on their walking speed from the Uralic home. Unfortunately this is only grey theory because Finland has met several migrations during the last 2000 years, but the baseline still remains. We don't man. Awesome comments. But if light skin was brought to europe by agriculturalists that might turn the hole thing on its head. SLC24A5 is recent, but not that recent, right? It's difficult to be sure of anything with this stuff anymore. Soon we might be reading in the La Brana paper that he had blue eyes, blond hair and light skin. For now, I'm willing to accept that foragers had darker skin, but lighter eyes, than farmers, and modern European pigmentation, including both light skin and high incidence of light eyes, is the result of these two pigmentation complexes mixing, plus some selection. So A at SLC24A5 might be of farmer origin. But who knows, because the Stuttgart sample was apparently mixed Basal Eurasian and WHG anyway. I do not accept the Near Eastern admixture in Sicilians and Maltese, even in the Jews it is problematic. All three groups have North African ancestry either via the Moors or through residence in North Africa. North Africans have a lot of Near Eastern type ancestry, its age I have no idea but certainly existed before the coming of Arabic speaking groups like Bedouins. Anyway the Near Eastern thing is just a soft option as it is unlikely too many Bedouin would have made the trip from Arabia to North Africa to Sicily and Malta. The Maltese are essentially modified Sicilians. Linguistically Maltese is derived from Siculo-Arabic which was derived from a 9th century form of Maghrebi Arabic spoken in Tunisia. It is logical to expect that Maltese would be much closer to Standard Arabic if derived from actual Arabs from Arabia, but Maltese and Arabic are not mutually intelligible. You say: "the model given in the paper models Europeans as a mixture of European Early Farmers, ANE and West Eurasian Hunter Gatherers". Actually, if you follow the supplemental materials, what they do is to compare them with Stuttgart (proxy for EEF), MA1 (proxy for ANE) and Lochsbour (proxy of Western European HGs, not "Eurasian" HGs). While Stuttgart is pretty much interchangeable with the other EEFs used in the PCA, Lochsbour particularly is not, being in fact very distant not just of modern Europeans in general, but of other Western and Scandinavian HGs. So the main question here is: how good proxy it is for the Western HG admixture? And the answer must be: very poor, almost certainly inducing large levels of error. There is no test controlling for alternative comparisons such as with Braña2, which seem much closer to modern Europeans and should produce very different apportions therefore. I'll try to explain that graphically in my upcoming blog entry. I believe I have spotted why MA1 produces such different appearance of similitude with Eastern Europeans, etc. If I'm correct, the PCA has a third dimension where the distance to East Asia and other Pacific Ocean regions manifests (that's why these populations are said to be "projected" but fall very close to the Caucasus and not out of graph, as they should in a normal bidimensional PCA). We know that MA1 has very strong affinity with Native Americans and therefore should score quite high in that third dimension, as the formal tests are absolute, they measure both: (a) distance in the flat bidimensional PCA and (b) the hidden distance in the third dimension, which must be quite important judging on them. So, as long as we accept MA1 as proxy for ANE, the formal tests are valid. However I do wonder which would be the measures if instead of the remote Siberian MA1, they used the other sample AG2 (which right not I'm not sure which one it is but must be mentioned somewhere). It is also possible that instead of such low frequencies, as happens with WHGs, the values would be at least somewhat higher (or even a lot higher) - sadly not knowing that "projected" third dimension, I can't measure the approx. difference at all. Projecting samples onto PCA is problematic when the number of markers exceeds the number of samples. This causes projection bias, which means that the projected samples fall closer to the middle of the plot than they would if they weren't projected. A lot of people don't correct for this, and I don't think these guys did it. Nevertheless, I mentioned the PCA because all of the ancient samples were projected. That means we can safely discuss the relationships between them on that plot, especially if we largely ignore the results of the other samples. ... "all of the ancient samples were projected". I did not notice that part before, thanks for mentioning, because it's obviously important. I would think that the (or maybe "a") PCA should have been done with the ancient samples only and, if anything then projecting the moderns in it. Otherwise what we see is how the ancients appear in relation to modern WEA genetics and not vice-versa, i.e. how moderns appear in relation to ancient genetics. 1. In the ANE component: AG2 appears as Mordovian and MA1 as intermediate between these and North Caucasians (with the known Native American tendency probably also manifest, even if the Karitiana themselves are also "projected"). 2. The WHG component: shows a great deal of variation in affinity to modern Europeans: Braña 2 and Skoglund are quite similar, Braña 1 and Motala quite less so, while Lochsbour is very distant in fact. Naturally Scandinavian HGs are more similar to NW and NE Europeans, while Western HGs (especially the Braña samples) are more similar to SW Europeans instead. 3. EEF component: seems almost identical to Sardinians and, quite interestingly, also Canarians. In general it seems to have a hidden African affinity, because if you trace a line from the European cluster to them, it falls close to Bedouins in the extreme, rather than close to Northern West Asia, as we should expect if they'd be a simple Europe-West Asian mix. This probably has some relation with yDNA E1b-V13, which ultimately must have an Egyptian origin. In fact EEFs tend only very weakly, if at all, towards West Asia (i.e. Turkey or Syria/Lebanon). So I'm getting quite wary of this simplistic West Asia vs WHG assumption: Egyptians should also be factored in, on one side, while, on the other, the WHG should be factored from the closest and not the farthest samples. Obviously if modern Europeans have some WHG ancestry, that will not uniform from all the ancient WHG populations, but stronger from some and weaker-to-zero from others like Lochsbour. So Lochsbour is a very mediocre proxy at best for WHG admixture, I must say, and there seem to be other issues hidden in the complexity. I like to hope that peer-review will solve some of these issues (although sincerely I doubt it) but in any case these are serious questions to be addressed in future studies with a more adequate, refined, strategy of analysis. So I wouldn't bother with that PCA too much, because it's almost useless. It seems they just ran it because PCAs are expected in these sorts of papers. All the really cool stuff is in the supplementary/extended PDFs where they discuss the formal mixture tests. I still haven't grasped it all, but it does make a lot of sense. That new SNP is an interesting finding! I went to see Terry's page http://www.goggo.com/terry/HaplogroupI1/ and saw that he has updated his Phylo Tree. On FT site, that I1d CTS2208, CTS5476 is indeed found in one German, American and English person. As L22+ is found in a wider area, including Poland and Karelia, it is possible that I1d CTS2208, CTS5476 is found also east of Germany, and also because commercial testing is concentrated in Western European countries. I1(xI2) frequency is quite high also in some parts of Belorussia: Central Belorussia 6.82%, West Belorussia 6.85%, WP Belorussia 8.26%. There is very little commercial testing in Belorussia and we might find interesting stuff there! I say this also because in Motala and Loschbour, it was specifically I and I2 that was found and not I1! Could be some kind of Phoenician link at play in Sicily, Malta, etc (before SSA gene flow in NW Africa). Would explain low levels of WHG in these populations. The ANE thing doesn't make sense to me. Mal'ta was very mixed with some WHG ancestry aka Upper Palaeolithic European ancestry who were the ancestors of WHG. Mal'ta seems like a mut not apart of a distinct population, what part of him was unique, besides being mixed? If they can somehow detect ANE admixture(what part), I think it may be connected with Y DNA R, maybe also Q in Native Americans. Who today has the highest amount of ANE, south-central Asians? ANE was absent from that LBK girl, and her ancestry mainly had just come out of the Near east. There was most likely no Y DNA R in her people, just G2a, E1b1b V13, J1, J2, T, and hunter gatherer I2. The farmers of Europe like the LBK girl, like Otzi, like Gok4 were not very similar to modern Near easterns, even though that is were they came from. The main ancestors of all the different near eastern people today, were probably somewhere around there but later the LBK girl's, Otzi's, and Gok4's people disappeared or mixed in. Y DNA R1b seems to have been in west Asia for a long time since before the Neolithic. The main ancestors of modern near easterns probably carried some R1b and that is where their ANE ancestry comes from. I think R1a1a1 M417 Indo Europeans that spread in east Europe and the R1b1a2a1a L11 ones that spread in west Europe, both probably carried ANE ancestry. Same with the near eastern people Italians and Balkaners most likely have mixed with since after the Neolithic. The Swedish hunter gatherers did have a good amount of ANE ancestry so it could have already been in some areas of Europe. Who knows it could have arrived in Finland because their main ancestors came from Russia were they mixed with the ancestors of many future Indo Europeans, there are a lot of possibilities. I can't believe that the Stuttgart was mixed Basal Eurasian. I totally respect these people who did this study, but honestly that sounds impossible. The ancestors of all modern Eurasians(and north Africans) in my opinion would have looked a lot like modern Admanese, Papuans, and sub Saharan Africans(I could be wrong of course). I know over 60,000 years that could have changed but I doubt they would have developed the exact same way as west Eurasians ancestors did. If the Stuttgart girl was so non west Eurasian, why did she have probably light skin, and I am guessing Caucasoid skeletal features. I believe this study may have found something but saying almost 50% non west Eurasian is honestly nuts. We now know blue eyes existed in Mesolithic west Europe, 2/2 samples(1 probably) have blue eyes so far, I really doubt they normally had dark skin. Europeans today with a lot of light hair and eyes also tend to have the lightest skin, while Europeans with a lot of EEF ancestry like Sardinia and most south Europeans will more oftenly have tannish skin, their known to be olive. Both light hair and light eyes are very exclusive to Europe, just like WHG ancestry. It makes the most sense to me the WHG had light skin like EEF did. The guy from Luxemburg shows Mesolithic west Europeans may not have been as pale as Lithuanians or Finnish, maybe more like Sami. He is just one sample though if we get more genomes from many different periods in Europe's history and many different regions we may see the depigmentation happen. Who knows the Luxemburg guy's people maybe didn't survive well, but other Mesolithic people did. His people could have been tannish. I think the Luxemburg guy was, because the LBK girl wasn't albino probably not very pale. Honestly I have seen many northwest Europeans with naturally tannish or brownish skin and also light colored eyes. Dark skin definitely existed in Mesolithic north-west Europe but may have been a minority like today. According to them Sardinians have 17.5% hunger gatherer admixture. Sardinians have a very high frequency of I2 that probably comes from the mesolithic europeans. If the Scots and English have such a high frequency of WHG, it does not show up in the mtdna (10-15%) or y-chromosome (10-15), I would expect the dinaric alps to have a very high frequency of WHG, it is possible that founder effects changed the landscape of uniparental variation, not just on the paternal side but also on the maternal side. The WHG were a pure group (few groups like this exist now) where almost everyone was lactose intolerant had blue eyes and black hair, and all had I y-dna and U5 U4 or U2 mtdna, they had a little variation so they were not clones (they didn't all have U5 and I2, they had other forms of U and I that are disconnected by millennial), I cant find one single modern group with less diversity than the mesolithic europeans who lived from at least north iberia to moscow, can you? On the other hand the neolithic Europeans(LBK) were highly admixed, using them as a component is not really scientific. Kristiina, you are right. We don't know yet where the CTS2208+ L287- is from. Now we can say only that very likely it has been in Germany, because also British finds (two) support it. But we really know nothing about Belorussia, nothing about Estonia, something about Poland and Germany. I asked a year ago from Finnish researcher about new yDna studies. They had no plans, in fact they had no idea about any new studies regarding the Baltic Sea region. "On the other hand the neolithic Europeans(LBK) were highly admixed, using them as a component is not really scientific." And yet they had been ALMOST (few exceptions) excluvively G people. Thats not "Highly admixed" to me. At least it does not show in their Y-DNA. Of course they seem to have been extremely diverse in their mtDNA. Agreed. David, I also don't get what exactly "basal eurasian" is. Is it the same thing as the "southwest asian" or "meditteranean" component that is frequently discussed? Barakobama raises an interesting point, in that the populations that carry most of this component don't appear all that similar phenotypically to papuans or aborigines who have are believe to be very early divergences. On Dienekes blog, it's been suggested the Basal Eurasians were a group that continued gene flow with NE Africans after other Eurasians split from Africa. Nubians-Natufians. My reading of Lazaridis was different. I thought that there was first a Nonafrican/African split. Second, basal Eurasians split from Non-Aricans. The other nonafricans continued to mix with each other, only later diverging to east and west branches. So the Basal Eurasians were isolated early. Either by geography or maybe endogamy would be my guess. Ie if their evolutionary trajectory had special functional adaptations (neurophysiological for instance). Or could be simple geographical isolation (like in North Africa if these were pre-Natufians). Papuans are actually closely related to the Onge. So they're Eastern non-Africans in this study, but with inflated Denisovan admixture. My understanding is that Basal Eurasian is a group that stayed in Arabia as the other Eurasians moved out, but finally expanded during the Neolithic. Also, I was just thinking, couldn't Basal Eurasian be responsible for Y-DNA E? Oh crap, I thought that linking "Basal Eurasian" to hg E was an original idea, but it's not. Here's a quote from the supplemental PDF. "More speculatively, some basal Eurasian admixture in the Near East may reflect the early presence of anatomically modern humans 7 in the Levant, or the populations responsible for the appearance of the Nubian Complex in Arabia 8 , both of which date much earlier than the widespread dissemination of modern humans across Eurasia. Finally, it could reflect continuing more recent gene flows between the Near East and nearby Africa after the initial out-of-Africa dispersal, perhaps associated with the spread of Y-chromosome haplogroup E subclades from eastern Africa 9, 10 into the Near East, which appeared at least 7,000 years ago into Neolithic Europe 11 ." Your right the Mesolithic Europeans were very unmixed. We don't know if all had black hair and blue eyes, just this one sample from Luxemburg probably did. We don't know the hair color of La Brana-1 according to a Spanish article he also had blue eyes, I would guess also black hair but probably paler skin. Not all Mesolithic Europeans had mtDNA U5, U4, and U2(U2e). C1f(only sample) and H found in Mesolithic Karelia. There are members of the RO family that have also been found in Palaeolithic Europe. It does seem they were very pure and traced their ancestry back over 30,000 years in Europe but they were not completely pure. There are some modern populations like that. Native Americans, Papuans, far southern Dravidens, San. Basal Eurasians might possible be represented both by Haplogroup G Y-DNA and mtdna haplogroup N1,N2 and X? How about hg E (Basal Eurasian) + hg G (Balkan or Anatolian WHG-like) = EEF? Maybe Basal Europeans is a huge category that is unscientific, maybe it is represented by both G and E. It should be divided into perhaps 2 subdivisions? G is highly divergent, being less closely related to K then H is(HIJK), I seriously doubt that the linearback had any E, we only have 3 samples of them. I seriously doubt that E lineages are responsible for 20% of the Scandinavian genepool. some basal Eurasian admixture in the Near East " This does not account for all basal Eurasian Admixture,. Do perople from india have basal Eurasian Admixture? If so Basal Eurasian may be simply represented by FXIJK of F Xhijk. E was found in Neolithic Iberian remains, but I don't recall the details. If WHG and ANE can be so phylogenetically close to each other, even though they seem to be represented by I and R, respectively, then I don't see why WHG-like populations elsewhere, like the Balkans, couldn't have carried G.
I any case, I think E is a really good candidate for the earliest Neolithic paternal marker in the Fertile Crescent. Davidski when they say Ashkenazi Jews, Sicilians, and Maltese have near eastern ancestry that cannot by explained by EEF. Do they mean EEF is related to what is in the Near east today or is extremely "Meditreaen" like, or is just they have non WHG and EEF west Eurasian ancestry, which is in modern near easterns. Italians and Balkaners have a pretty high amount of near eastern ancestry that has not been found in any Neolithic Europeans. How do we explain it? In globe13 their southwest Asian vs west Asian percentages are the same so they possibly got it from the same source. I am guessing it could be from the metal ages or Neolithic, the high amount of J and E1b1b in Italy and the Balkans may be connected. Typically near eastern mtDNA is also highest in Italy and the Balkans. I really don't understand the ANE thing, what is it? MA1 was very mixed so how could there be a pure component that represents him? I know that other ancient north Eurasian was very west Eurasian like but still I am very confused on what ANE really is. Is it highest in the Kalash and other south-central Asians? Do you think it could be connected with Gedrosia in K12b? Is it very west Eurasian like? It seems people are trying to classify this pre historic extinct population and it is just in the air and very hard to understand. Whatever ANE is I think it may be connected with Y DNA R. The fact it exists in Native Americans, near easterns, and Europeans is very surprising, maybe Y DNA P is the original connection. Irish have almost exclusively Y DNA R1b P312 but almost all their ancestry comes from pre Neolithic European hunter gatherers(No R1b), and early European farmers who came form the near east(No R1b). There are many different ways a paternal or maternal lineage becomes the most popular in a population. The early European farmers do seem to be a distinct people though in autosomal DNA. Wow, I didn't know the Onge were very related to Papuans. Who are very related to native Australians right? It makes sense they have the same black skin, nappy hair, and similar facial features(not Australians). I have heard many just assume the Onge have been there for 60,000 years and are not very related to other non Africans. Are Papuans-Onge-Australians in the same eastern Eurasian group as East Asians aka Mongoloids? I have an idea of what west Eurasian is but it seems south Asians are their own group(despite west Eurasian features), maybe also mixed between different non African groups. Y DNA E1b1b is the dominate Y DNA haplogroup of north Africans, who are overwhelmingly west Eurasian. It would make sense to me way back when in the Palaeolithic some west Eurasian E1b1b's went to the near east and then went to Europe in the Neolithic. Y DNA E it self I have heard is suppose to have originated in sub Saharan Africans not non Africans. I know very little about it though. This basal Eurasian origin of E might make sense since its brotherclade D is exclusively non African. Y DNA G is most diverse around Iran and the Caucasus right? I doubt it was WGH like, who so far we can only connected with Y DNA I, there are probably others though. The basal Eurasian thing doesn't make sense to me mainly because of the west Eurasian phenotype of these farmers. If there were a people who branched off from the common ancestors of all modern non Africans, they would not have west Eurasian features. Where is the strange unknown so far branches of M and N in these farmers? I think they found something because they know what their doing but I doubt it was basal Eurasian. The genetic structure of the Near East and North Africa changed after the Near Eastern ancestors of EEF migrated to Europe. Sicilians, Maltese and Ashkenazi Jews have relatively high admixtures from the Near East and North Africa from after this period of change. And I don't think MA1 was mixed. It's just that his population contributed DNA to a wide variety of modern Eurasian groups, while the WHG only contributed DNA to modern Europeans. The 7,000 year old Epicardial Spain was E1b1b V13 the most popular type in Europe today, there were three G2a's in the same site. Davidski if you don't already, you need to check out Ancient Eurasian DNA, it has tons of info along with sources to the study's. Wow, Davidski did you see how close AG2 was to northeast Europeans(most Mesolithic), on PCA thing. There was some weird unexpected stuff like Basque and south French being close to the Brana's when all other evidence points to them being closest to northeast Europeans. But still I think AG2 may have had some Palaeolithic European ancestry or related ancestry. The 32% N. European in K=19 for MA1 is evidence he also had Palaeolithic European ancestry. I think that may be why they are phylogenetically close to each other. Or maybe they were a brother group. MA1;s people had a related culture to what is in Europe at the same time so they were connected to Europe. Y DNA E is very old and has many different lineages in many different places so I think its story is probably very complicated. Are there modern people with basal Eurasian? That could somehow be connected with Y DNA G and other haplogroups that leave the tree early, I don't know. Neolithic Iberian remains ARE NOT LBK, LBK had N1a mtdna. N1a mtdna was never found in iberia according to ancient dna. It seems they tested a limited number of SNPs. It would be nice to see them test more of the I1 and I2 defining SNPs to see if the I* sample falls into pre-I1, I2, or some other line. That I2-M423* is found in 7500-8000 year old remains is consistent with Ken Nordtvedt's datings, as is that these sample are negative for the downstream SNPs they tested which are younger, per Nordtvedt, than the samples. The Swedish hunter gatherers had typical Mesolithic European mtDNA haplogroups, they also had I2a1b like the Luxemburg guy. They definitely had similar ancestry, all in K=19 came out 100% NE. European. So you think MA1 got those results because his people later mixed with many Eurasians? The reason Europeans have some ANE is because it WHG then to modern Europeans? How can that be true if ANE ancestry probably spread in most of Europe during the metal ages. What do you think MA1's people were? That tree you should me thinks they were a brother group to west Eurasians not specifically WHG. Being a brother group of WHG might make sense since the MA1 people had a similar culture to ones in Europe at the same time. I am still very confused with the ANE they still seem to be a up in the air and mystical while WHG is something I can touch and understand. I am happy there is now even more evidence early European farmers were pretty different from modern near easterns. I didn't like people biasedly assuming LBK's mtDNA would be similar to modern near easterns, when really it wasn't. It was more similar to modern near easterns than the hunter gatherers of Europe but that's it, their subclades matched more with Europe. A lot of their subclades like J1c are sister clades to more typically near eastern J1b. The Meditreaen component or whatever you and other keep finding I think without I doubt descends from EEF. Otzi had some southwest Asian and west Asian though and Gok4 had some southwest Asian(globe13). So they had some ancestry from I guess the main ancestors of modern near easterns. It is interesting to see how the EEF Meditreaen is connected with southwest Asian in obviously southwest Asia. Otzi had much more southwest Asian in globe13 than west Asian and Gok4 had only southwest Asian so that I guess could be evidence their connected. It is surprising EEF were also pretty pale skinned like Mesolithic Europeans probably were. Modern people in the Caucasus and Sardinia are also pretty pale skinned, this could mean that pale skin was not exclusive a European trait in west Eurasia 10,000 years ago. I read about that gene that affects pale skin on Dienkes and how it is so spread out in west Eurasia and has a over age estimate that is over 20,000 years old. I think that is WGH EEF had some kind of common origin. But maybe WGH was very blue eyed, dark haired, and tannish skinned but I doubt mainly tannish skinned. LBK had N1a were not closely related to the neolithic iberian remains, due to the lack of N1a and F*/H in Iberia . LBK almost certainly lacked E1b1b which is supported by 3 ancient remains. Basal Eurasian admixture is found in LBK which helps prove that most likely basal eurasian admixture is not directly associated with E.
They had similarities, Y DNA G2a has been found in both, they had many of the same mtDNA haplogroups not found in European hunter gatherers. Autosomal DNA has already shown similarties between Otzi, Gok4, this LBK girl, and a Neolithic Iberian. The La Brana hunter gatherers had some 'Meditreaen" ancestry probably because of mixing with Neolithic Iberians. Both Cardiel and LBK are suppose to come from the same Greek Neolithic source. There mtDNA definitely has some difference but without a doubt they had common ancestry. "E was found in Neolithic Iberian remains, but I don't recall the details". L'Avellaner cave (Garrotxa District, Catalan Pyrenees) produced G2a and E1b-V13, probably Cardium Pottery arrivals, along with two of the four mtDNA lineages (K1a1a and T2b). The other two mtDNA lineages are probably aboriginal (most likely U5b and H1). Similarly a later Chalcolithic site in nearby Languedoc produced G2a (fixed in a single haplotype) and I2a in the patrilineal side, along with a mixture of "Neolithic" and "Paleolithic" lineages on the matrilineal one: 3 H1, 3 H3, 2 HV0*, 1 V, 1 U*, 5 U5, 2 K1a, 6 J1, 2 T2b and 4 X2. They did not carry the West European lactose tolerance allele, just as Central European EEFs didn't either. The first ones spotted with these allele are Chalcolithic Basques of the Ebro basin, in a very interesting scenario of still incipient admixture (most are homozygous for either allele). I'm of the opinion that the T allele in the rs4988235 (lactose tolerance) site is of Western HG origin (a mere fluke, no obvious selection involved, at least not in a long time). "I don't see why WHG-like populations elsewhere, like the Balkans, couldn't have carried G". Mostly because G and particularly G2a is not too common today in that region. While G2 is present in Greece, it is always found at low frequencies, unlike I2 or E1b, which are much more common and, together with J subclades, make the bulk of the yDNA pool. On the other hand G2a is much more important in Italy, so maybe it underwent a founder effect over there that manifested also further West (Iberia particularly). On the other hand, barring the Caucasus and some Palestinians (both most unlikely sources of Neolithic flows), G or G2a is also not more important in West Asia than it is in Italy or Iberia. Frequencies in Turkey are smaller than in Italy or Portugal for example. Curiously it is also found in Egypt (only relevant place in Africa for this lineage), so maybe there's some founder-effect correlation between G2a and E1b-V13 (unclear though). "I any case, I think E is a really good candidate for the earliest Neolithic paternal marker in the Fertile Crescent". Almost certainly not: E (outside Africa) seems to have experienced a distribution along the Eastern Meditarranean coasts but is rare to no-existent further inland. In fact the high frequencies found in Greece and Albania have no parallel in West Asia other than to some extent the Southern Levant. E certainly had no role in the area of Mesopotamia nor further East (and only very limited impact in Anatolia), so it must have arrived via coastal routes from Palestine/Egypt almost certainly. I think you guys are missing the bigger and more interesting picture painted by Z74 by focusing on CTS2208. Z74 unites the western, more Norwegian branch of L22 that is L813+ with the eastern, Bothnian branch that is CTS2208+. My suspicion is that Z74 will have a center in Sweden, suggesting a mode of dispersal of L22+ Z74+ I1 in Scandinavia. Admittedly, this isn't really my area of interest, but it's now overlapping increasingly with my area of interest, so I need to look into it in detail at some point. "Neolithic Iberian remains ARE NOT LBK, LBK had N1a mtdna. N1a mtdna was never found in iberia according to ancient dna". Well, the main reason is not genetic but archaeological LBK never arrived anywhere beyond the Seine river (except for a very brief transitional period at its very end in the area of Brittany). On the other hand Cardium-related influences did arrive to the southern and western parts Central Europe (La Hoguette), overlapping with early LBK. In the genetic aspect it is true that N1a as such has not been clearly spotted in Iberian aDNA (although some "N" sequences are worth a second look probably) but it has been spotted in SW France (Megalithic context) at frequencies very similar to those found in LBK sites: 1 H, 1 X2, 1 N1a. 1. Is contemporary of the late phases of PPNB, the oldest Neolithic without doubts in Anatolia and the Levant, previous phases like PPNA or Gobekli Tepe are transitional (Mesolithic) and probably still largely hunter-gatherer in their economy, if not totally. 3. It may have some links to Anatolian Neolithic but the matter remains in need of clarification (non-PPNB sites are invariably more recent or at best contemporary to the earliest Thessalian Neolithic). In brief: it is likely that Thessalian Neolithic had some roots in West Asia but its exact relations remain obscure to this day. It is also one of the oldest Neolithic areas outside the Fertile Crescent core and its pottery is one of the oldest ones (excepting East Asia). On the other hand it is clear that the two main branches of European Neolithic had their roots in Thessaly: Sesklo for the Painted Pottery branch (leading later to Linear Bands Pottery, LBK) and Otzaki for the Impressed Pottery branch (leading later to Cardium Pottery). The presence of Cardium Pottery in late Biblos (Lebanon) is derived not original (as its late dates should reveal on their own). Eastern European Neolithic is unrelated to these branches and probably has local Epipaleolithic roots (Dniepr-Don culture). It is less clear but also very likely that the Almagra Pottery sites of Southern Iberia and the earliest Megalithic sites of Portugal are also older than the arrival of Cardium Pottery to Eastern Iberia (mostly) and therefore not directly related to this Thessalian Neolithic or only obliquely so. Also, back to the East, the area of Jarmo (and therefore by extension Mesopotamia, Iran, etc.) seems to have developed a distinct Neolithic tradition. So there is some distinction between East and West in the Fertile Crescent (in addition to also some distinction between North and South in the Western part of it). Probably we should consider three different regions in the Fertile Crescent: the Levant, Anatolia and the Zagros-Mesopotamia area. But they had connections also, of course (and the area of Gobekli Tepe may have been a major connecting node, as well as later the cities of the Upper Euphrates like Mari, etc.). The issue of possible Egyptian influences in Palestinian Mesolithic is a bit confuse but likely to be real, especially durable may have been their influence in the semi-desert specialist Harifian culture, which in turn is probably the ultimate origin of Semitic cultures (via the PPNC and the Circum-Arabian Pastoralist Complex). What is not clear is how these influences reached Greece or whether if this arrival was still Mesolithic or already Neolithic. But I would bet for a "coastal route" type of link, something that would later characterize the Impressed-Cardium branch (deep sea sailing demonstrated). They had a genetic relationship somewhat In mtDNA, but definitely in Y DNA and autosomal DNA, plus they came from the same Greek Neolithic source. Is Basal Eurasian in modern Europeans? If it isn't even in Sardinia that wouldn't make sense. True, the proportions I have given are only valid for the assumptions of their model, where Early European Farmers are over slightly half "West Eurasian" and slightly under half "Basal Eurasian" (which really, properly could be called "Ancient Mediterranean" instead, among other speculative names, I guess, on the basis of its distribution). Whether using the Iberian La Brana samples would give different results than Loschbour in their f statistics (and whether this would affect their models) sounds like something worth emailing the study authors about, and then including in your blog response, if you get an answer you can disclose. It might be that they were unable to use these samples as a comparison due to the low coverage of these samples, which maybe are not at a level where they have confidence they can get the right statistical power out. If this is the case, hopefully these tests will be replicated with fuller coverage La Brana genomes, later in 2014, so perhaps we should treat these as more caveated results until then. And hopefully by a lab, although I'm sure the genome bloggers can have a stab at it. I just posted a comment at bioRxiv, which is waiting to be approved, but I didn't say anything about the Basal Eurasians. I was just questioning the validity of classifying WHG and ANE as separate ancestral populations, as opposed to just meta-populations of a wider Northwest Eurasian forager gene pool. You should post your question there. I'm sure the authors are watching the comments section and will reply eventually. Getting them involved in a discussion could be really interesting, and might result in some changes to the final draft. But who knows, we might get swiftly checkmated instead. Pyromatic, I didn't miss the Z74, I was answering to Barak who has bad shortages in his knowledge about the North European history and the CTS2208 is the link between larger I1 groups and the Bothnian. I agree with you. The Z74 is one of the most interesting branches connecting Norwegian and Finnish branches. We have obviously only one pure Z74 case, in Sweden, although a lot of samples in Norwegian and Finnish subclades. Hopefully we come to see more Z74 cases without known downstream mutations and could estimate the origin of that mutation. If Basal Eurasians were pre-Natufians, then they might have had an evolutionary tendency to prefer sedentism (even if they moved around by necessity) that eventually led to agriculture. It looks like WHG and ANE were two endpoints of a chain of hunting cultures, which would entail a very different adaptive strategy from an evolutionary point of view. I would really like to know whether ANE for instance had more Neanderthal introgression. Something people might be missing wrt Basal Eurasians and EEF is this. Look at Table 1 in the paper. f3 statistics show that Arabs are a mix of Stuttgart EEF and African. When did this happen? We badly need ancient DNA from the Middle East to get a handle on why this is before making too many assumptions based on modern populations. Indeed, this paper suggests that the Middle East is nothing like it was during the Neolithic genetically. The two main culprits were Sub-Saharan African admixture, probably in large part due to the slave trade from the early historic period to basically today, and ANE + R1 steppe horde admixture during the metal ages. I am actually wondering if these early splits involved evolutionary adaptations during range expansions. For instance: what if the Non-africans were becoming more migratory and hunter adapted (maybe mixing with Neanderthals in some cases) during a range expansion out of Africa. This would put new evolutionary pressure on the Non-africans in terms of physical and cognitive adaptations. It could be the Basal Eurasians were the Non-africans that were initially "left behind" by the multitude of expanding hunting cultures for various reasons. Self selection and maybe exclusion by the hunter males for not being physically or psychologically fit. This sort of anti-adaptation to hunting then unexpectedly segued into a different evolutionary arc based on sedentism (seen in Natufians), which fortuitously led to agriculture. Just a theory. But could explain the otherwise strange separation of Basals from other Non-africans at this stage. If Basals = Natufians, then they might have been active in North Africa too (not just Levant) and were sedentary before agriculture (which seems otherwise hard to explain, unless they were initially just those "left behind" by an incipient hunter specialization during a range expansion of Non-africans). Sorry Davidski, my last comment was aimed at @ Maju's earlier comment in response to me, as I didn't make that clear at all. The Onge are closer to South Asians and East asians than they are to papuans and malenesians. If basal eurasian is E1b1b associated we should at least see a type of basal eurasian in the onge. I am left wondering also about where Y-DNA haplogroup J may have been during the Neolithic. It is a bit surprising that none has shown up so far in Neolithic male remains from Europe. Maybe it did not expand out of the Near East/West Asia until the Bronze Age or later. Or maybe some will show up in the Balkans from the Neolithic period once some remains from there are tested. Maybe J comes out to be pretty young in Europe. A so young and still quiet impressive admixture must be visible in Y-DNA, I am sure. And will most likely take up at least some parts of the J and E in Europe. I remember the times, pre y-dna wars, when people admired the spirit of innovation, and adaptability of once thought proto-Europeans, that was responsible for the very base of human civilization - farming. Now, since its emergence is not represented by certain groups of interest, various imaginative stories emerge, basically dancing around the fact that the leap of human ingenuity happened within some other group. A strange separation is likely to be from various layers, phases of immigration. Living on their own for tens of thousands of years. Being excluded because others saw them as inferior hunters is out of context. You seem to expect a native population to abandon their ways, tradition, and an early ancestral land (ritual burials of ancestors), for an opportunistic venture with strangers. They were already self-sufficient and able to sustain themselves while adapting to nature. It’s a new perspective, and I can see your perception a bit skewed toward glorifying other . You imply a Neanderthal differentiation as a game changer. Neanderthal was very much widespread in the ME so all people probably had similar admixture, except for those that did not stay too long. I expect no visible differentiation until people acquired Neanderthal admixture in Siberia. Admixture does not necessarily translate to better hunter, nor some advanced evolutionary model. Man is an omnivore. You promote a speculative hierarchy model, with meat dependency on top. Neanderthals were outcompeted for a reason. Greater meat dependence means that burning proteins instead of carbs. Much of the time in processes of digesting meat, rest of the time preparation for hunting. So, apart from on spot ingenuity, they had less time and energy for thinking and applying complex solutions. Natufians were still hunter gatherers, and first domesticated dogs found in their graves indicate a deep connection with hunting. They hunted gazelles, wild boars, ibexes for quite some time before the proposed climate changes happened which influenced their ecosystem slowly, during a period of thousand years. This could be why they remained in what was once a paradise on earth, and adapted. You offered an image of hunters that can’t actually hunt, live of the land before the invention of agriculture, being both physically and mentally weak and miraculously surviving wild animals, diseases and other confronting groups. At the same time they invent and implement, a labor intensive activity that asks for a giant leap of faith for an incredibly rudimentary, and incomplete meal. All of that while being pioneers of civilization. Why does hunter gatherer isolate and stay in one place? They have enough food or are adapted to hunting in a niche that others find uninviting. Nobody cares about them if seen as inferior. The land they inhabited is not appealing for other hunters. Adaptation to bad hunting condition- better, more inventive hunters. Maybe this was a part of an intuitive strategy by Natufians to specialize and settle in certain place discouraging new immigration. Settlers know the terrain, are better prepared for hunting and defending location from trespassers. Early nomadic groups would presumably prefer uninhabited and undisturbed areas than confrontation and competition. Maybe not a question of them being left behind, but maybe left alone? Primary reasons for migration out of group or related groups other than climate? If one population reached a certain level where animals were being hunted out, we could speculate that hunting became more difficult and competitive, so some decided to leave. The task of searching for easier prey-better conditions was always undertaken by a small opportunistic bunch of people. The adventurous nature in men could be a potent driving mechanism, once civilized. On the other hand one must not turn the face from hardships and should stay on the spot to overcome the forces of nature, to mature and evolve. This is a reward for those that decide to stay. The hunting spirit lives in all of us. The patterns of perception and reaction that make an excellent hunter group might be completely disruptive or useless in a small farming collective. Conversely, the patterns of social interaction and empathy that make a small settled community a warm and mutually supportive place might be useless or disruptive in a hunting band. Cognitive/behavioral adaptations can be context specific and contrary to other adaptive tendencies. Humans are rather ruthless pack animals (especially when resources are scarce) that push out and exclude members of the group that don't fit the group's mold. When many groups are shaped by similar environmental circumstances and therefore exert similar forms of peer pressure and exclusion, that becomes natural selection and or sexual selection. Range expansions are a time when things like this become important. No reason (especially with intelligent social mammals like humans) this fissioning could not generate two groups, one Natufian tending and another Eurasian hunter specialized. Human nature is to "glorify" your own group ideal, so probably hunters thought they were the One a True Way and farmers thought the same about themselves. That's neither here nor there, objectively. What matters is how this type of changed shaped evolutionary history, fissioning or forming a cooperative symbiosis etc. Just a theory, but could explain the unusual Basal Eurasian phenomenon. When I read about character differences in people with wide or slim faces I thought about selection aswell. But then came up secondary studies that said, there is no difference. In time of stress and danger for the group, more ready to sacrifice himself to protect/save the groups existance. Why's that? Do the Onge carry E1b1b? I doubt it. Onge are closer to South Indians, East Asians and Papuans than to Basal Eurasians or any type of Western Eurasians. That I1d-Z74 (L22+ Z74+) is found in one Swede on the coast near Finland. I still think that we cannot be at all sure of the origin of I1 until Eastern Baltic Sea area, Belorussia and Russia are better explored. Mikej2, do you have any idea to which haplotypes Saami, Komi or Mordvin I1 haplotypes belong? Kristiina, I have no idea, I only wait for new SNP results and accept everything that is based on scientific work. I stopped already long time ago expressing my opinion about where the I1 is from, or I answer that from Poland or Canada :-) But regarding Russian results you can ask from the Russian forum Molgen. I find some of the combinations really interesting. Scottland and Sardinia are somewhat the oposite of each others. Sardinia aprears to have lots of HG Y-DNA and mtDNA but very low HG autosomal DNA. Scottland has lots of HG autosomal DNA but is very low on HG mtDNA and Y-DNA. Finland is high in HG Y-DNA and mtDNA and (we have no data, but I guess) high on HG autosomal. The Baltic states are high (relatively compared to other European states) on HG mtDNA and autosomal DNA but low on Y-DNA. Scandinavia has lots of autosomal and Y-DNA from HG but is low (the south) on mtDNA. I also observe many cases of HG Y-DNA and HG mtDNA beeing complementary. Britian, France, Scandinavia, Germany and Ukraine, all show a pattern in where the part of the country with many HG Y-DNA is the one wich is low on HG mtDNA and the part of the country wich is high on HG mtDNA is low on HG Y-DNA. So under that model, Y-DNA R1a, R1b and N1c1, and also mtDNA H, can be linked to the dissemination of hunter-gatherer autosomal DNA across Europe. In fact, even people who belonged to Y-DNA J and G and were part of the later Indo-European groups, like Celts, Slavs and Germanics, disseminated WHG and ANE across Europe, because that's what they were mostly despite their Y-DNA. @Fanty: Which haplogroups are you associating with HG? I wouldn't pay too much attention to outdated phenotype theories. Hard to imagine any necessary close connection between facial appearance and evolutionary adaptations from so long ago. There are some nice tables early in this thread. Minimum EEF in Europe is 32.2%, median is 57.7%. If people look like Otzi in many various ways and combinations in any given corner of Europe, it's no real surprise. CEOs are not "hunters," they are business people engaging in mercantile behavior in a modern economy. That said, I don't doubt that the population of Navy SEALs has a very different cognitive/behavioral profile than the conscientious objector Quakers or Harvard Business School grads for that matter. Vets have an age old problem readapting to civilian life for a reason. Cognitive/behavioral predispositions amplified by experience and memory, so neural pathways are nothing like average civilian and definitely different than the kind of people who were draft dodgers. Think of that fissioning happening across a population: all the Navy SEALs leave and all the Quakers stay. Maybe the Harvard MBA's split their chances with either group. I am seeing a relationship with bioclimatic zones (Subtropical/Mediterranean mostly yellow, Temperate mixed, Boreal Forest/Taiga warm tones). Thanks, the WHG/EEF/ANE map came out great. Those of you with accounts at GEDmatch should try the EEF-WHG-ANE test for Europeans. It's based on Eurogenes K13 ancestry proportions. Awesome, bro! Love your blog and the effort you put forth in your projects. Keep up the good work! Sorry, if this is a double post as the first one did not appear. As I was looking at the maps by Gui S., I couldn't help but notice how the ANE in central Europe matched with the location of R1b-L11 before it split into the Celtic and Germanic groups. Perhaps, it's all linked and shows R1b as more Pontic than it is Near Eastern. Logically, it seems to make sense. However, with everything that's come up lately, logic may not help at all. Another hypothesis I have is that the basal is the group that either stayed behind in the Near East or back migrated there. Next, either the WHG and ANE broke off at the same time going in opposite directions, or these two due to their relation, moved north together through the northwest part of the sub-continent. They then split in Central Asia or West Siberia, going to their respective locations. Again, as some have brought up before; where is J? Is it intrusive to the Near East? Obviously I being HG and with no basal, as well as no HG in the basal, we have a problem. Unless J and I split 30-40kya, one staying with the basal. This has got my head spinning. ANE was present in southern Sweden during the Mesolithic, and probably all over Eastern Europe, but it only spread across much of the rest of the continent after the Neolithic. So it's association with Eastern Europe and Y-DNA R, as opposed to just R1b, looks very reasonable at the moment. As for Y-DNA J, wouldn't that be associated with late Neolithic, and even historic, gene flow from Anatolia, and thus a late entry of EEF-like admixture into Europe, which today makes some Mediterranean European groups genetic outliers from Europe? IJ. We know I is at least Mesolithic in a Europe. J might be ANE in a Middle East and S Europe (entering S Europe from later Middle Eastern migrations). R. Probably ANE, given relation to Q. Levite-Kurdish-Azeri-Karmanian R1a is almost definitely ANE. Leaves maybe E as Basal Eurasian. Do Africans and Asians with DE lineages have Basal Eurasian admixture? The one known I1-Z74* is American of Swedish descent. Where in Sweden is unknown at this time, but based on some of his closest matches (GD of 1 or 2), his ancestor likely hails from Småland. You may all be very interested to know that Ken Nordtvedt contacted one of the study's authors and had him check the various SNPs thought to be phyloequivalent to M423 in the Loschbour and Motala12 remains. He states that approximately half of these SNPs are derived and the other half ancestral in these remains, breaking the phyloequivalence and suggesting that these individuals are from the population ancestral to the modern I2-M423 crowd or on a separate, now extinct line. He's updated his I2-M423 tree to reflect the positions of Loschbour and Motala12 on the tree. Any chance we can get the calculator with the eutest v2 k15? That seems to be more accurate in my ancestry than the new k13. Thanks!! Keep up the great work! "Why on earth should genes that control behavior stuck to genes that control phyical apearance?" It would have to signal something important. Say ability-propensity for violence was at least partially related to testosterone levels in the womb and those testosterone levels also influenced facial shape such that squareheads were both more likely to be violent and better at it while slimheads were less likely and less capable. In a violent environment females who preferred squareheads might have more surviving children on average and increase as a proportion of the population whereas females who preferred slimheads might have less. If the environment became more peaceful then the process would be reversed. That would provide a simple mechanism to adapt to changing levels of violence in the environment. If correct then squarehead and slimhead male skulls could reflect the level of violence in the environment at a particular time rather than population shifts. Just to stress the critical point. The above would only work if *all* populations had both squareheads and slimheads with just the proportions shifting based on their (relatively) recent environmental history. Could be simply testosterone levels. Also anatomical adjustments for chewing meat etc. Wrt "signaling," in nature there is also convergent evolution or homoplasy. These evolutionary factors are very different from the genomic clusters in k means etc (just population history). Two populations can have different population histories but convergent evolutionary adaptations. Or complementary adaptations. Morphology is fine for signaling. But is subject to being wrong for inferring phylogeny, especially superficial features the human brain responds to. Look to nature for many examples of homoplasy. But ultimately for humans the cognitive behavioral adaptations are key, including related to social functions. A society with no MIT professors would be as disadvantageous as a society with no Navy SEALs. But the MIT profs would mostly fail "mental toughness" trials, just as the SEALs might fail the math requirements at MIT. Complementary specializations. @Grey, US Marines are not very selective. Navy SEALs are extremely selective, so is a better comparison to MIT profs (another but very different extremely high functioning collective). But wrt evolutionary cognitive adaptations, look at the facial expressions presented in each group photo. One group presents as very friendly,empathic, relaxed, open. Other group (even though the marine is not a large guy) presents very different posture. Speaks to preferred neurological states and getting back to main point, neurophysiological adaptations during human evolutionary history. Or look up a documentary about Navy SEAL "mental toughness" trials. Nonreaction to pain, logical approach to situations that would panic the average person. Basically selecting for individuals able to use neocortex to override amygdala functions. "A society with no MIT professors would be as disadvantageous as a society with no Navy SEALs." Quite so and if the optimal frequency of each type varied with the environment then you'd need a mechanism to modify the frequency. "CEOs are not "hunters," they are business people engaging in mercantile behavior in a modern economy." I didnt say that CEOs are Hunters. I said that I ead about a paper that claimed that companies with wide faced CEOs are more successfull than companies with slim faced CEOs. Ötzi has Farmer genes but his phenotype is more H/G than Farmer. He does not match the Farmer stereotype. What Y-DNA I connect to HG? Neither Scottland, Scandinavia, Finland or the Baltic states have many of this. On the other hand have countries stuffed with HG YDNA (Sardinia and the Balcans) not so much HG autosomal DNA. The concept of phenotypes isnt THAT outdated at all. 1. old school antropologists claim Farmers are a people, because they have different skulls. 3. aDNA proves: the farmers had been a different people...old school anthros had it right. But yeah of course lifestyle must affect phenotypes aswell, after all there had been major penotype changes in the past 2000 years without major migrations to explain them. Like ..... around Christs birth, most Europeans seemed to have a Farmer style phenotype while from like 900AD - 1700AD Europeans more and more resemble mesolithic HG and from 1700AD- today they seem to farmerize again. And there was no migration that would explain it. Fanty, I am responding not so much to you citing the paper as the sort of pop-culture extrapolations of these things. I think the average CEO would have been completely useless in a Paleolithic hunting band. It's just a different skill set, with different cognitive priorities. It's common for business people to talk about themselves as "hunting" in pop culture, and this is fun and motivational, but should not be confused with thinking of actual hunting cooperatives. I submit that a much better modern cognitive-behavioral analog for an archaic hunting collective would be SEAL Team 6. I point this out because I think there are evolutionary neurophysiological differences involved. I think this might relate to the split of NonAfricans into two groups: Basal and ANE/WHG. Both sets left Africa for some reason and separated from Mbuti. I think the ANE/WHG sapiens expanded out into hostile/unknown territory (Middle East?) where Neanderthal was around. Probably coming into conflict and mixing (ANE?). Visible Neanderthaloid skull features show up in archaic Russian crania even in Eneolithic. This was noted in some of the Kurgan crania. Inherited from ANE? This range expansion placed evolutionary demands and maybe involved introgression for Neanderthal genes (including cognitive/behavioral genes). These Sapiens became functionally less chimp-like and more wolf-like. The Basals were sedentary "homebodies" stayed behind (outskirts of Africa? ), maybe with many individuals actively rejected by hunter bands but also by self-selection. They might have also been go-betweens who tried to keep contacts with Africans and Eurasian WHG/ANE, possibly also choosing to avoid (dangerous?) encounters with Neanderthals. This would itself be its own type of evolutionary selection, against wolf-like characteristics (and Neanderthal genes?). The historical changes you are talking about in European skulls could be inter-class differences in population growth. The modern period is the time of the bourgeoisie and their cognitive-behavioral specializations. Cranial anatomy might be relevant because it tracks neural anatomy (i.e., shape and - function? - of the brain). The farmers were different people not just because of population movements, but because these little villages were (IMO) hotbeds of evolutionary selection. Health problems and new selective stresses of every kind. Bad diet, changed environment, inbreeding depression but also quick fixation of any beneficial traits. A new kind of human emerged out of these farming settlements. One biproduct might be light skin color (adaptation to Vitamin D deficiency in cloudy conditions and low meat diet). I don't believe in a "10,000 Year Explosion." I think there were times of abrupt change over the course of just a few centuries and maybe generations. I think the range expansion out of Africa into old Neanderthal territory (Basal vs ANE/WHG) I speculated about was one. I think farming was another. These evolutionary situations (first wolf-like hunting collectives; later farming settlements) were places where only some people went. Many left, and many didn't make it. New traits selected for by these windows of intense change then diffused out to other populations. Well, its simple to determine what WHG genes cause and what EEF genes cause. WHG genes are the one thing that seperates Europeans from non-europeans. And its also the thing that makes the difference between northern Europeans and southern Europeans. As northern Europeans are a mix between both (Scandinavians even equally) while southern Europeans are close enough to almost be pure EEF. The WHG-Genes must be the difference then, right? So, what IS the difference? Except of course for coloration of eyes and hair, wich is clear. Who says the northern EEF like Gok4 were not blond, blue, and fair skinned? They were living in northern latitudes. Also, Fanty you are assuming that these WHG-EEF-ANE components are the sources of all functional genetic variation in Europeans. I'm not sure that's the case. If anything, the process of mixture itself WHG+Basal (=EEF), then EEF+WHG, then EEF+WHG+ANE (or separately in various combinations?) could have been a time of intense social selection (that's technically "sexual selection" in Darwinian terms). Making hunters into people who can live successfully in a dense, internally peaceful farming collective settlement would have been tricky. Some of that is acculturation, but some of it might have involved evolutionary selection. Co-adaptive traits. Since pigmentation keeps coming up. From conversion spreadsheet: Irish have higher WHG % than the English and Dutch and a few percent higher than Germans and Austrians. I can tell you that in Ireland, literally the only natural blond I met was Polish. Most Irish have brown or even black hair, with some redheads - but the Irish are uniformly pale and pasty (skin type 0 or 1) and many can't tan, at all. Natural blonds are very common (even in adults) in Dutch, Germans, etc. - who are less pale than the Irish and can generally achieve a golden/bronze tan with no redness. This tells me that even if WHG had some blonds and fair skinned people (we now know that some had blue eyes and brown skin), either there was already local pigment variation (reasonable possibility). Or these highly visible traits have been shaped by later populations that came into Europe (light pigmented northern EEF?) or social/sexual selection. Darwinian sexual (social) selection for light hair/eyes/skin could have acted on more than one population, precisely because it was a visual cue of "group belonging." Maybe it co-evolved in some WHG and in EEF and helped them get along better and protect each other. I think it is wrong to say that the Siberian influx was caused by Uralic migrations. The Siberian component in Northeastern Europe actually peaks in the Arctic region, not in the Uralic Volga-Ural urheimat. It is highest in Norweigan Saami, and it is also high along the whole Arctic coast, whether Slavic- or Uralic speaking. Siberian-ness is simply something which has been native to the region for a long time. Obviosuly there has been many influx of ENA genes into Europe, but I think it would be a sensation if any could actually be connected to linguistic expansion. There are many opinions on the Uralic origins - the most extreme are at one end is that Uralic formed a genetic family with Indo-European (Indo-Uralic). The most extreme on the other end is that Uralic migrated from the East and only acquired later loan words from PIE. Davidski seems to assume the latter. Most linguists argue for a compromise, however. Uralic was a group close to PIE with very early loan words. Yes, the fact that ANE can be linked to Y-DNA R and the arrival of Indo-European languages deep in Europe during the Copper Age, and ENA to at least some subclades of Y-DNA N, and the arrival of Uralic languages deep in Europe during the Bronze Age, is very interesting indeed. That's probably why I blogged about it twice. And you seem to be confused about the relationship between Indo-European and Uralic. The two aren't all that closely related, but their homelands did probably abut each other, and that's why they share many early loans. But the ANE Proto-Indo-Europeans seem to have been mainly pastoralists, and as a result much more numerous than the nearby ENA Uralics, who were certainly mainly hunter-gatherers still. So when the Indo-Europeans expanded west and east, they didn't drag much ENA with them. Also, when the Uralics expanded west, they weren't numerous enough to affect the genetic structure of Europe by and large, so the ENA they brought with them has since mostly stayed as a minor component among their Uralic-speaking descendants. For some background about the Indo-Europeans and their relationship to Uralics, check out these videos..
"And you seem to be confused about the relationship between Indo-European and Uralic. The two aren't all that closely related, but their homelands did probably abut each other, and that's why they share many early loans." They also share part of the core vocabulary, such as the word for "name", so a phylogenetic common origin cannot be ruled out. Many linguists such as Collinder supports this theory. While it's perhaps not the majority view, I wonder why only side of the scientific debate is seen as credible? The link you posted goes to an article that challenges the current consensus by suggesting an Eastern origin. Why do you regard this as more correct? In short, what are the actual reasons to assume that Uralics were ENA? All Uralic speakers and groups from former Uralic regions of Russia (like the Kargopol Russians from the HGDP) carry significant levels of ENA. The only exceptions are the two westernmost groups who are actually overwhelmingly of Indo-European ancestry; Hungarians and Estonians. ENA from the European Arctic can't explain this away as a coincidence, because most of the Uralics and former Uralics west of the Volga in Russia never had regular contacts with anyone from the Arctic, and yet their ENA levels are clearly higher than among people from long standing Indo-European (Slavic and former Baltic) regions of Russia. Well, all Uralic people also live neighbors with Siberian peoples, except Estonians and Hungarians. Finns, Saami and Estonians also stem from the same Baltic population, post-Baltic contact, something which is evident from linguistics. Saami has acquired a high Siberian admixture however, as they migrated the furthest North. They also gave a significant share of Siberian genes to the Finns. This is the most common explanation I have seen in Scandinavian anthropology. The Siberian admixture in Mordvins is probably a separate affair, since it has also been shown to be a different admixture. But it shouldn't be hard to explain as the neighbouring Ugric peoples are at least partly Siberian. As I said, I dont dispute the ENA influx, just the connection to Uralic expansion, since I think it depends on too many assumptions. The only assumption I'm making is that the early Uralics from the southern Urals took significant levels of ENA with them to the west. This assumption is supported by the presence of non-trivial Siberian admixture among all Uralics except the two most western groups. There might have been extra Siberian gene flow into many Uralic speaking groups from other sources. But this doesn't change what I said. It may just be me but neither of the two browsers i have installed will load the comments above 200 on the Laziridis thread. Look up the Kent, UK bronze and iron age dig site. Eight of the 13 bodies had tested for isotopes from Southern Scandinavia. Meaning that they grew up there during enamel formation on their teeth. Nine were local, how many were kids of people from Scandinavia, they don't know. Five were from the Western Mediterranean. 8 of 13 foreign born, excuse me. 25 in all. Chad you simplify Indo European even early ones where not all the same. How do you explain 35%+ WHG in modern north-west Europeans while just 5,000 years ago right before Indo Europeans arrived they were typical EEF? The connection between Indo European and ANE will turn out to be much more complicated than you say. There is WHG in the near east even if Indo Europeans were pure ANE. Why do you and Davidski ignore over 30% mtDNA U5, U4, and U2e(all typical Mesolithic European), and that they had majority light hair and eyes which today correlate with WHG ancestry and the "blue eye" mutation has been found in 2/2 Mesolithic European samples? You really think they had little WHG ancestry? Do you think somehow the ANE people in central Asia developed the exact same phenotype as WHG in Europe? It made a little genetic effect on Bretons and doesn't explain why Insular Celts and Germanics(Norse-) have such similar results in admixtures. autosomal dna map, Britain, Ireland, Scandinavia and the Low countries all very linked it seems. "How do you explain 35%+ WHG in modern north-west Europeans while just 5,000 years ago right before Indo Europeans arrived they were typical EEF?" barakobama. Think about what you are implying. If there is no Mesolithic in NW Europe, then what happened to them? Did the farmers kill them all off with pitchforks and stones? Think about it. They mixed. There were fewer farmers up North than the South, naturally, so the mix shifted towards WHG naturally. Look at the clines. WHG increases as you go away from the Farmer heavy Mediterranean, yet ANE is pretty much unchanged. If your Indo Europeans were so heavy in WHG, then where is it on the Mediterranean where you see high ANE? Where is it in the Near East where you see ANE? Or Asia? There was no light hair in the Mesolithic samples. They had similar phenotype because they are the basically the SAME derived West Eurasian people. The difference is that ANE is the group that mixed into Native Americans, therefore making it appear different or shifted East. There is no European WGH outside of Europe, therefore it is not the component of Proto-IE people. We cannot explain it 500 times. Read the paper. As I said before, the only way that ANE stays steady, is if it is the last thing thrown in, and it must be a pure or nearly pure component through Europe as they mix in. No one else fits that description post Neolithic except IE speaking people. There are no mass graves anywhere in Europe. They mixed. There was no killing off of people. There was Mesolithic left over! Period!!! Chad can you please make paragraphs it would be much easier to read? I am going to have to read Laz 2013 like 1,000 times before I understand everything and make good conclusions. You cant make the assumption that the reason modern north Europeans have much more Mesolithic ancestry than southern is because the farmers slowly mixed with the hunter gatherers as they went north. How many hunter gatherers do you see in Europe today(sami have around 30% EEF don't mention them their ancestors were farmers)? How many full blooded WHG people are there in killed off and there was a small amount of their blood in farmers. Autosomal DNA results Swedish Funnel beaker farmers is prove what you say is not true. Even Laz 2013 said the results of the Swedish farmers, Otzi, Stuttgart, and modern Sardinia are very similar. Ancient mtDNA and Y DNA from Neolithic Europe is also very good evidence they did rarely mix with hunter gatherers and basically replaced them. Why would all of a sudden over 2,000 years after the farmers arrived would they begin to admix so much with hunter gatherers(doubt many where left) that some would become mainly of hunter gatherer blood? There were not enough hunter gatherers to be the source of the amount of WHG in modern west Europeans. How many modern west Europeans have Y DNA pre-I2a1b or a close relative to I2a1b and C-V20? Maybe around 0.00000000001% both those haplogroups have been found in Mesolithic west Europe. How many Finnish have mtDNA U5a, U4, and U2e the answer is well under 5% even though those three haplogroups take up about 100% of mtDNA samples from Mesolithic Scandinavia. I highly doubt a lot of blood from Mesolithic Scandinavians survived. There is really no genetic evidence for heavy mixing with hunter gatherers and farmers right before Indo European migrations. I know it doesn't make sense to say Indo Europeans raised EEF and ANE in southern Europe if anything only ANE. But for the rest of Europe it does make sense to say Indo Europeans and Uralics were heavy in WHG and ANE. I don't think of that test as if it is some type of God I consider a lot of possibilities this all could be a lie. In many admixtures I have seen there is north European(aka hunter gatherer) ancestry in all southern Europeans except Sardinians I really thought that could have something to do with Indo Europeans. I don't think you really understand what ANE is you just repeat what others say. ANE seems very west Eurasian it only seems part east Eurasian in admixtures probably because native Americans have some. You say there is no WHG outside of Europe even though you haven't seen results of so many different Asian people that may have WHG. You are making assumptions to fit your hypothesis. I cant believe you are still ignoring the correlation between WHG and light hair and eyes. There is one Mesolithic hair color sample!! 2/2 have the blue eye mutation that convinces me light hair also existed in Mesolithic Europe. The hypothesis they were dark skinned, black haired, blue eyed ignores all evidence in modern people light hair, eyes, and skin are all connected. You still ignore over 30% mtDNA U2e, U5, and U4 in Indo Iranians too. That's more than any modern Europeans the rest of their mtDNA was typical of Neolithic Europeans. So they probably had a lot of EEF and WHG. Can you give me an examples of likely ANE mtDNA? No you cant because ANE may be fake or because it is more complicated and mixed up than what most say. That is one admixture I am not convinced at all. Chad, I don't want to be your enemy, it is just when people get frustrated we insult others. I am just trying to understand all of this stuff and find out what really happened, you know what I mean? We're not enemies. Here's an example of mixing for you. Pitted Ware Culture in Sweden. Look up ajv70 and ajv52 in google. Lots on them. Some cultures are a mix of Hunter and Farmer. Some have some farming, but resemble hunters more. There was a mix going on. More so in the north, as the hunters were starting to take up farming too. Not only does there appear to be a small farmer link, but also a Saami link with the group. It mixed in with Scandinavians at this time to varying degrees. The fact that the native language, probably related to Uralic is found under Germanic, is another clue to the mixing. If HG died out, why would the language be there? These are some people suspected of abandoning farming to go back to hunters. Former Funnelbeakers possibly. I know what ANE is. You are the one saying it is not related to WHG, not me. WHG and ANE both have U mtdna. 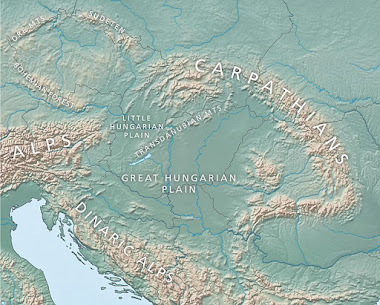 Gravettian culture appears to spread from Central Europe to Mal'ta. Both WHG ( I )and ANE (R) are derived west Eurasians. You say that you want to learn, but ignore everything that you are told and shown. If you wanted to learn, you would listen. If you can prove that IE people are WHG, then do so. It is impossible to prove looking at the numbers. The lack of European WHG in Mediterranean people with ANE, the Near East and Asia. The paper says that WHG is not found outside of Europe. It is not my conclusion. It makes no sense talking about it if all you have is speculation. I am giving you papers, examples, and the math. I see no point in discussing it further. Also look at the plots on the maps for Laz paper. They WHG meet in a V near modern Spanish and French. La Brana is not far from modern Spaniards. It may already have some North African mixed in the Mesolithic. Brits and other Northerners cluster near the Scandinavian HG. That is figured as Motala played a role in populating Britain. Davidski(or someone else) can you please help explain the F-Statistics. Here is a quote from pg.7 which kind of explains it. related to Loschbour, Stuttgart and MA1, we analyzed f3(X; Ref1, Ref2) statistics which measure the correlation in nucleotide frequency differences between a test sample and two populations: (X-Ref1) and (X-Ref2). If the three populations are related by a simple tree, the statistic is expected to be positive5. However, if X is admixed between populations related to Ref1 and Ref2, the statistic can be negative and provides evidence of admixture in population X5. For each present-day West Eurasian population, we tested all possible modern reference populations with at least 4 individuals, along with Loschbour, Stuttgart, Motala12 and MA1 (Table 1). For the majority of European populations (n=18) the lowest f3-statistic is observed with Loschbour and a Near Eastern population as references, suggesting that many Europeans derive from a mixture between WHG and populations related to present-day Near Easterners. Only Sardinians form their lowest f3-statistic with Loschbour-Stuttgart so the mixture process is unlikely to have been a simple WHG-EEF one (Table 1). Other European populations form their lowest f3-statistics with MA1-Stuttgart, which we hypothesize reflects the cline of increasing relatedness to MA1 in Fig.1B. In the Near East, no population has its lowest f3-statistic with Loschbour or Motala12, but all have their lowest f3-statistic with Stuttgart (Table 1), suggesting that most of the ancestry of this sample may be directly inherited from populations of the ancient Near East, while modern Near Easterners have additional influences related to Africa, North Eurasia, or South Asia (Table 1)." I don't know what nucleotide frequencies are but that doesn't matter because what matters are the results. I think it might be the same as an allele in a SNP. What do they mean by a simple tree? Do they mean the three populations only relation is very ancient ancestry and their populations haven't mixed since they split, like it would be for an Irish and Chinese person? Do F-statistics somehow find if a population is admixed or just tell how related they are? I understand that the lower the number the more related or more likely admixed. When they say a population forms its lowest F3-statistic with for example Chinese-Japanese does that mean most of that population's ancestry from a related people to Japanese and Chinese or that those where the top two most related people to them? Why would most modern European populations form the lowest F3-statistic with Loschbour-modern near easterns than with Loschbour-Stuttgart? They don't really give the details so I don't know the full meaning of that statement. It is interesting that Sardinians are the only ones who form their lowest F3-statistics with Stuttgart-Loschbour because they always have unique results in admixtures compared to other Europeans and their results are always very similar to Otzi and the Funnel beaker farmers, and in Laz 2013's admixtures to Stuttgart. The fact that "other" Europeans form their lowest F3-statistics with MA1-Stuttgart probably means there is MA1 related ancestry in "other" Europeans and it is higher than Loschbour related ancestry. When they say no modern near easterns form their lowest F3-statistics with Loschbour and MA1 do they mean when those two where included because it is F3 not F2? Also when they say modern near easterns all formed their lowest F3-statistic with Stuttgart, does that mean they did F2? This doesn't mean there is no WHG ancestry in the near east just a lot more Stuttgart related ancestry, I think they excluded the possibility that there are different types of ancestry within the near east that can be very unrelated. I will have more questions and statements later. I am starting to understand this stuff. I believe the last thing I saw states that west Asians and Europeans today are closely related by ane admixture in both. Another hint at an ane ie people invading both, making them look more related than they are. Whg like, not European whg specifically. That's important. 1) You think that the genetically Mediterranean Neolithic farmers of Northern, Western and Central Europe were representative of Northern, Western and Central Europeans of the time, when in fact, there were people hiding in the woods during this period across Northern, Western and Central Europe who were Mesolithic-like (ie. very North European). 2) You seem to think that mtDNA U can only be linked to WHG, when in fact, the presence of U2, U4, U5 etc. in prehistoric Eastern Europe, Central Asia and Siberia suggests they're ANE markers as well. On globe 13, La Brana is more than twice as much "Mediterranean", as ajv70 and 52. Possibly more evidence of that mixture you ask about. There is other evidence he had some farmer ancestry, It is not a big surprise since he is 7,000 years old and farmers had arrived in Iberia by that time. The admixture between farmers and his people probably occurred quite a few generations before him. There may be common ANE ancestry in west Asians and Europeans but the reason they seem so related is because they are so related. North Africans who from what I know have no ANE ancestry fall into the same west Eurasian group. There is evidence of strong relation between west Asians and Europeans in mtDNA too and phenotype. There are obviously Caucasian skull shapes from pre Neolithic Europe from Europeans who probably had no ANE ancestry. North Africans have a small amount of ANE, less than the Near East, but it's there. Small influx during recent history, and old R1b entrance to the Near East and spread with Egyptian and Islamic culture can explain it. ANE makes Europeans and West Asians closer. Europeans are more derived. Basal in the Near East and West Asia is 60-80%+ In Europeans it is topped out at 40% only 15-25% in the North. So Europeans would be as far from West Asia as Native Americans are from Malta as the percentages are similar. They do not plot that close without ANE pulling them to a single point. Of course ANE is not in the southern WHG pre Neolithic, from samples so far. Hence, they pull more towards Basques, Spaniards and French. Northern Europeans are around the Scandinavian hunters as they are a good chunk of their Mesolithic heritage. Take out that 40%EEF in the North and ANE from West Asians and they go way towards Malta and then some as Malta is in the Near East. They wouldn't look like they share any ancestry. Northern Europeans would be way more off the charts than Loschbour. Sure. It's just interesting to me as I'd always assumed Britain would be more genetically connected to France. Didn't you say this three weeks ago? Yet, here you are saying they were wiped out in the North because you aren't seeing a lot of the haplogroups discovered in digs so far. "Basing everything on mtDNA H is a joke!! It was a bad assumption people made that it must mean that it will be constant with total ancestry." "Autosomal DNA results Swedish Funnel beaker farmers is prove what you say is not true." There were megalithic farmers at various sites along the coast (so they could complement poor farming conditions with fishing) for a very long time. The surviving fishing/hunting forager culture of the north/northwest beyond the range of LBK turned into Funnelbeaker culture (as a result of megalithic farmers mixing with the foragers imo). "How many modern west Europeans have Y DNA pre-I2a1b or a close relative to I2a1b and C-V20?" How many have G? Both I and G were later swamped by R (imo) but where is the biggest concentration of I? "It was dominated by animal husbandry of sheep, cattle, pigs and goats, but there was also hunting and fishing. Primitive wheat and barley was grown on small patches that were fast depleted, due to which the population frequently moved small distances." Shifting agriculture. Slash and burn - just like Tacitus describes. Thinking about it in terms of ecozones i would bet the northern edge of LBK is where the conifer forest line was at that time (it is up near Finland now but has been retreating north since the LGM) and it's the boreal forest that is suited to slash and burn farming). The problem with the idea that ANE=PIE is that Gujaratis (N India) and Vishvakarmans (S India) don't have any. Some (not all) Gujaratis have a little EEF (almost totally IE part of India), but not Vishvakarmans (Dravidian area). That could match IE. ANE looks a lot like Kurgan expansions and could have something to do with IE in Europe. But it can't be the mechanism that brought IE deep into India, because it isn't there. That leaves us with PIE = EEF or something else. Only alternative is that no genetic component really encapsulates that language spread, and "Indo European" was more a cultural package than a population. Personally, I think Europeans got a lot of what seems like "Europeanness" from EEF. Arabs have it too, just in a different flavor. The real essential EEF is neither exclusively Euro or Asian, but sui generis that influenced the development of populations in both places since the Neolithic. EEF might seem both completely foreign and strangely familiar to us. - Caucasus populations tend to give the most negative f3 statistics with Onge for South Asians, i.e. the populations who represent the "West Eurasian" ancestry of South Asians are most like Caucasus people. - Caucasus populations appear to be the most negative f3 for Ancient North Eurasians (MA-1), once similarity with Ancient North Eurasians and Western Hunter Gatherers is resolved for Europeans. - Yet the South Asians don't appear to give negative f3 statistics for MA-1 itself, but some do for Stuttgart (EEF). A theory I'll tender for this would be that, although the original PIE may have been Ancient North Eurasian, their descendants who picked up a sort of EEF ancestry but without any real WHG mixture (basically like Caucasus people may be) were the ones who actually moved into India. EEF may be much more like the (Indo-European?) Ancestral North Indian blend of (ANE + EEF - WHG) than than ANE itself is (since ANE is relatively like WHG), so that maybe is why it may gives more negative f3 statistics. It would naturally be just an elite-dominance in India. It's not the large movement archeologically, like the one into Europe. I believe India was much more densely populated at that time. By the time they were in the Tarim basin and other regional sites, we already see a population that is hybridized with the mtDNA records (many East Eurasian and Near Eastern). It could only be more admixed by the time they reached North India. I've heard what Matt says about Caucasus people. I believe it was Georgians who show to be most similar to the ANI branch. "The problem with the idea that ANE=PIE is that Gujaratis (N India) and Vishvakarmans (S India) don't have any." This isn't really an answer to your question as I don't know enough but I've been thinking about the Norman conquest of England and how relatively easy it was after the native warrior-elite was killed. then its easy to see how a cavalry/chariot invader could quite easily conquer a much *larger* population once the native warrior elite is killed because a non horse-culture population without suitable anti-cavalry terrain can't train large blocks of disciplined infantry any more. So i'm wondering how much actual IE mixture there might be after a chain of conquests starting from IE population A conquering a much larger population B followed by now IE elite dominated B (not A) conquering large population C and C conquering large population D in a chain. So how much Norman DNA is in England compared with how much in Ireland, Wales or Scotland - increasing or decreasing? - and then again how much compared to America, Canada, Australia, New Zealand, South Africa etc - an increasing percentage or a decreasing one? The other thing I wonder but haven't checked out is how may IE expansions into North India were there i.e. was there an Indo-European speaking but non-steppe population first (on foot with sheep) followed later by a steppe version (on horses with cattle)? The UK may provide a similarity here again i.e. an early IE expansion (Celtic) having a very dramatic effect on a similar or lower population density target then a second (Germanic) into a similar population size also having a dramatic impact then a third (Viking) into a larger population having somewhat less (although hard to say as they were mostly the same as the A-S) and then finally the Normans invading a much larger population and having ? impact. @Grey, I have a really hard time accepting mass language replacement in a place as big and dense as India without some kind of identifiable population movement. The comparison with England is worthwhile, but Englishness is also inscrutable in its own way too. I saw a documentary where a British woman (rich, apparently) from the Roman times showed clear African features. Border societies and colonies with access to new trade routes and upward economic mobility (like Roman Britain and Norman England) can be a melting pot for migrants from all over. @Matt, so you are thinking that maybe ANI was Basal + ANE? I wonder if there is any way to test f_3 stats from synthetic ANI or Basal individuals based on projected allele frequencies. It would be good to know how ANI fits in with MA1, Stuttgart, Basal, also in terms of PCA and admixture performance. Hopefully, we will see genomes from Farmana this year. I bet we will have some surprises. Davidski besides "Fisher gatherer" mtDNA from Blätterhöhle, Germany what evidence is there hunter gatherers were hiding in the woods? Look at the hundreds of mtDNA samples from Neolithic west-central-north Europe it is pretty obvious the farmers mainly replaced the hunter gatherers. How popular are Loschbour, Motola12's, and La Brana-1's Y DNA lineages today? Why would farmers and hunter gatherer begin to mix in the late Neolithic? There were probably not nearly enough hunter gatherers to be the source of most WHG ancestry in modern north-west Europeans. We know through ancient mtDNA that Mesolithic Europeans were dominated by mtDNA U5, U4, and U2e. Why would ANE people who had been separated from WHG for 10,000's of years have the same mtDNA haplogroups? MA1 had mtDNA U but he was apart of a lineage that doesn't exist today and has no relatives passed U, so just as related as U5 is to U6. The fact there hasn't been any obvious ANE mtDNA discovered shows the whole ANE thing is probably more complicated than even Laz 2013 says. Can you guys please show me evidence that light hair and eyes correlates with ANE ancestry? I have noticed it correlates almost perfectly with WHG ancestry. Since those bronze and iron age Indo Iranians had typical farmer and hunter gatherer mtDNA and had majority light hair and eyes obviously that means they were mainly WHG and EEF not ANE. Grey can you please not simplify Y DNA G its specifically G2a. There have been so many migrations that you wont find correlation in a major way to probably any haplogroup if you go back to the Neolithic and Mesolithic. Don't simplfy Y DNA I, you have to research the subclades. Most Y DNA I today could very likely be from recent migrations and not left overs from the Mesolithic. All of the Y DNA I from Mesolithic Motola, Sweden was negative for I1 which takes up practically all y DNA I in Scandinavia today. So any Y DNA I Funnel Beaker culture picked up from Mesolithic Scandinavians or central Europeans was probably some type of I2a1. Y DNA I in different areas have very different histories and migration paths. My whole point has been that Neolithic north-west Europeans were mainly replaced by Indo Europeans who came in the metal ages. That is why Y DNA G2a is much more rare today than it was in the Neolithic. R1b L11 and R1a Z282 became the dominate Y DNA haplogroups of most of the areas G2a was probably dominate. You know that autosomal DNA from Funnel beaker farmers basically proves your hypothesis Funnel beaker culture had a lot of hunter gatherer ancestry incorrect. How much Y DNA I2a1 is there in Scandinavia today? The late Mesolithic Ertebølle people were probably replaced like Mesolithic Europeans in mainland Europe. "Davidski besides "Fisher gatherer" mtDNA from Blätterhöhle, Germany what evidence is there hunter gatherers were hiding in the woods?" Look at the I distribution. "Why would farmers and hunter gatherer begin to mix in the late Neolithic?" Maybe it wasn't time but place i.e. they didn't mix until the farmers reached the northern limit of the neolithic package (but not the limit of a shifting agriculture version of it). In other words where was the boreal forest line in 4000 BC? I wonder about Basal in ASI and ANI as the skin allele sharing shows heavy shared ancestry between the Near East, South Asia and Europe. Especially the former two. "My whole point has been that Neolithic north-west Europeans were mainly replaced by Indo Europeans who came in the metal ages." Well to me the most likely option is various clades of I were dominant in western Europe until a big wedge of R travelling NE to SW came through the middle. "You know that autosomal DNA from Funnel beaker farmers basically proves your hypothesis Funnel beaker culture had a lot of hunter gatherer ancestry incorrect." It doesn't prove that. If the Funnelbeaker culture developed to fit into a forest ecozone which wasn't suitable for the standard neolithic package but was suitable for a shifting agriculture version of it then the transition is likely to have taken place around the edge of the farmer zone - whether the LBK or the megalith culture farmers. To disprove the point you'd need Funnelbeaker DNA from the farmer edge deeper into the forest around the Baltic that doesn't show that doesn't a EEF -> WHG cline. There's plenty of R1a-Z645 all the way from Europe to India, and this surely is the Indo-European marker. So the ANE must be there as well, but maybe it's muffled because it got heavily diluted along the way, as often happens with autosomal components? Maybe the paternal signal of the Indo-Europeans survived better because they were highly patriarchal and patrilineal? "Since those bronze and iron age Indo Iranians had typical farmer and hunter gatherer mtDNA and had majority light hair and eyes obviously that means they were mainly WHG and EEF not ANE." How do you know that this wasn't the typical ANE/EEF mtDNA on the steppe back then? maybe even caste systems in place. Restrictive breeding on locals could ensure their dominance, no matter how diluted their descendants would be mating with locals females. India is a head scratcher no matter which theory is on the table. Very high levels of R1a without any accompanying autosomal component from East Europe or f_3 stat showing ANE mixture. If the Caucasus like ANI in India goes back 12 kya and also brought R1a, it can't be IE without complete rethinking of how old IE really is. I know nobody wants to consider this, but my theory is that EEF could be the mechanism. Could also be the vector for light pigmentation in India and Turko Mongols. Remember, Scythians came later and had more than one tribe in their culture. They show up in Assyrian records. The Pazyryk tomb shows a pink skinned man with dark hair and non-Mongol features (just like Catacombs by the way). We know there was a big influx from Mideast into Central Asia around time of Scythians (1st millennium BCE). Maybe some light pigment alleles came in then too. Look closely at the study that found light hair and eyes near Karasuk area. Those were not Afanadevo; they were much later (Iron Age if I recall). Still not excluding late West Asian origin, even though today we think of those people as darker (post Mohammed). I mentioned some big counter examples with evolutionary rationale for why light skin/hair might not be pre-Neolithic. So far data points don't prove me wrong. What was the model used by Patterson to test for ANE in India again? Did he explore the issue in some detail? Maybe the ANE is indeed being lumped into the EEF and/or the ASI proxy? It's very difficult to imagine that there would be no ANE in South Asia considering the loads of R1a and R2 there. Did he test the Pakistani populations? Because mtDNA U5 and U4 have been found in nearly every Mesolithic European site with mtDNA samples and two 31,155ybp pre U5's were found in the Czech Republic, because U2e has been found in Mesolithic Germany, Sweden, and Karelia. U5, U4, and U2e were all typical of WHG people why would they also be typical in ANE people? The rest of the mtDNA of Indo Iranian samples from the bronze and iron age were either east Eurasian or some type of haplogroup typical of modern west Eurasians and Neolithic European farmers. I don't see evidence of non WHG and EEF ancestry in their mtDNA and I don't see any evidence in modern European or near eastern mtDNA. Their hair and eye color is very good evidence they had a high amount of WHG I don't think anyone would argue against that. @Davidski, lack of ANE in India is from f_3 stats for Gujarat posted by Nick Patterson on Dienekes blog comments (I quoted here too for Seinundzeit). But paper does not cover this. Btw, we know about West Asian influx to Steppe bc of diachronic study of Siberian mtDNA (Dienekes covered it sometime in 2013 or maybe 2012). Not all Y DNA I is the same. There are plenty of I subclades in Europe many that have been separated since the Mesolithic or upper Palaeolithic. I1 probably wasn't in Scandinavia during the Mesolithic instead all the I was probably some type of I2a1 or just I2 which might amount to 1-3% of modern Scandinavian Y DNA. Most I in Europe today probably expanded after the Mesolithic. You and Davidski you using this idea that there were plenty of hunter gatherers in north-west Europe during the Neolithic and they began to mix with farmers in the late Neolithic so that your Indo European=pure descendants of ANE still seems reasonable. How else do you explain the rise of WHG in north-west Europe in the metal ages besides with Indo Europeans. Indo Iranians probably had a very high amount of WHG ancestry based on their hair and eye color and mtDNA. The Unetice culture shows a very surprisingly high amount of mtDNA U5(mainly U5a), U4, and U2e. So how come the Andronovo remains show markers for light eyes and hair? The Pazyryk Scythians just look like an continuation of the Andronovo population. They both show links to Eastern Europe via nuclear, Y-DNA and mtDNA, not to the Near East.